After a large, deadly explosive and effusive eruption during 1963-64, Indonesia's Mount Agung was quiet until a new eruption began in November 2017 (BGVN 43:01). A lava dome emerged into the summit crater at the end of November and intermittent plumes of ash rose as high as 3 km above the summit through the end of the year. Activity continued into 2018 with explosions that produced ash plumes rising multiple kilometers above the summit, and the growth of the lava dome within the summit crater. 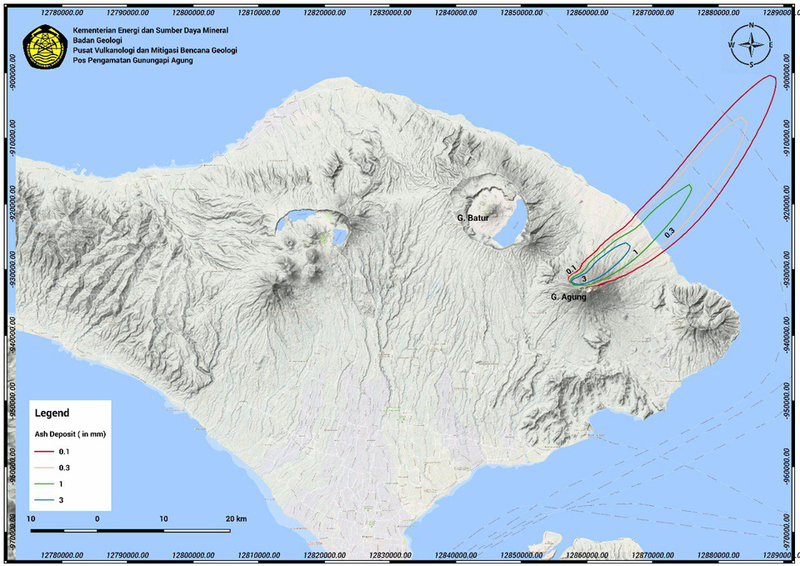 Information about the ongoing eruptive episode comes from Pusat Vulkanologi dan Mitigasi Bencana Geologi (PVMBG), also known as the Indonesian Center for Volcanology and Geological Hazard Mitigation (CVGHM), the Darwin Volcanic Ash Advisory Center (VAAC), and multiple sources of satellite data. This report covers the ongoing eruption from January through July 2018. 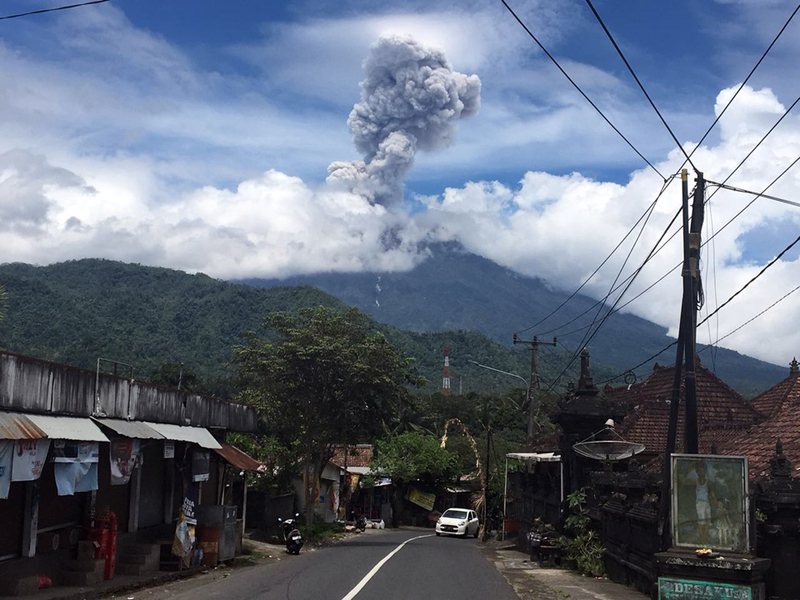 Intermittent explosions with ash plumes were reported at Agung several times during January 2018, including Strombolian activity on 19 January. Activity decreased significantly by the end of the month; only one explosion with ash was reported during February. Two ash plumes were reported in March and three were reported each month during April and May. A more substantial explosion in mid-June produced an ash plume that rose to 7 km altitude. A series of deep-seated earthquakes during the third week of June was followed by large explosions and new effusions of lava inside the summit crater beginning on 28 June. A strong thermal signal also appeared on 28 June that gradually diminished during July. Intermittent plumes of steam and ash recurred daily until 19 July; plume heights rose up to 3 km above the summit on several occasions. Strombolian explosions on 2 and 8 July sent ejecta as far as 2 km from the summit. Explosive activity became more intermittent during the last two weeks of the month; the last reported explosion was on 27 July. Activity during January-May 2018. During most days of January 2018 when fog was not obscuring the summit, PVMGB reported plumes of steam and minor ash rising about 500 m above the summit. In addition, intermittent explosions produced higher, denser ash plumes that rose 1,000-2,500 m above the summit several times. Ash plumes on 1 and 2 January rose to 1,000 and 1,500 m above the summit; incandescence was observed at the summit on both nights, and trace ashfall was reported at the Rendang Post on 2 January. The Darwin VAAC reported the ash plume on 1 January at 6.1 km altitude moving SW. A single MODVOLC thermal alert was recorded on 4 January. On 5 January PVMGB lowered the evacuation radius from 10 to 6 km, permitting the return of thousands of displaced people to their homes. 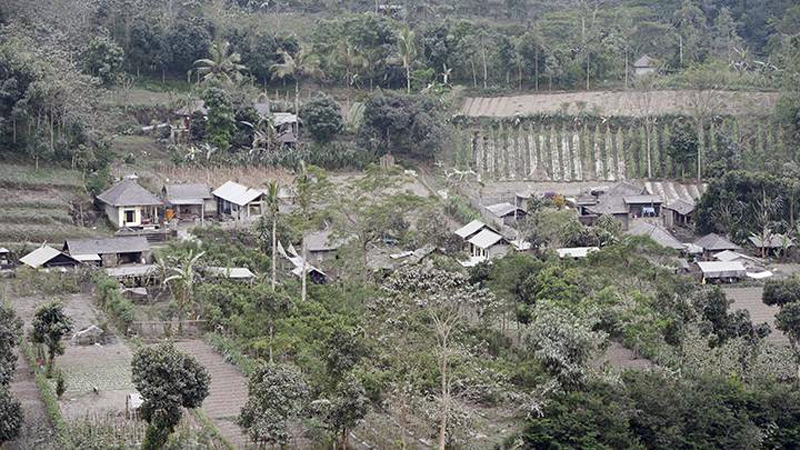 Approximately 17,000 people in seven villages within 6 km of Agung were still under evacuation orders from the events of late 2017. The Agung Volcano Observatory issued VONA's (Volcano Observatory Notice for Aviation) on 4, 8, 9, 11, 15, 17, 19, 23, 24, and 30 January relating to the larger explosions and ash plumes. On 11 January, an ash plume rose to 2,500 m above the summit and drifted N and NE (figure 29). Another 2,500-m-high ash plume on 19 January was accompanied by Strombolian activity at the summit for several hours, and incandescent ejecta that traveled 1,000 m from the crater. Ashfall was later reported in Tulamben village in the Kubu district (9 km NE) and in Purwekerti village in the Abang district (14 km ENE). Visual monitoring using drones carried out on 22 January showed that the volume of the lava dome was relatively unchanged at around 20 million m3. The summit was obscured by fog for the last week of the month. Figure 29. 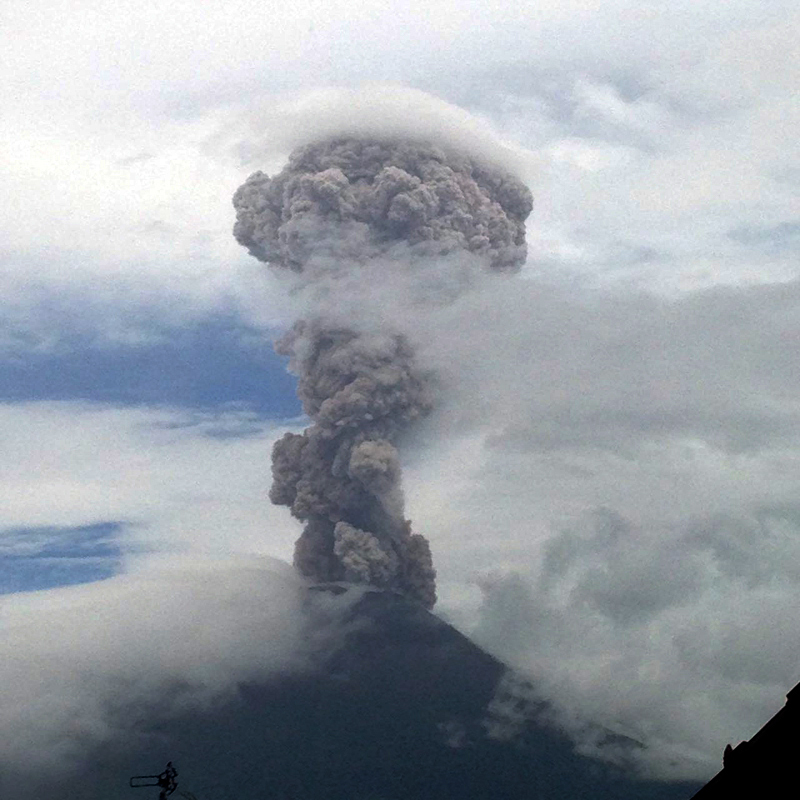 An eruption at Agung on 11 January 2018 sent an ash plume to 2,500 m above the summit. Courtesy of MAGMA Indonesia and PVMBG (Erupsi Gunung Agung 11 Januari 2018 17:54 WITA). Activity decreased noticeably in late January and February. Steam and minor ash plumes rose only 50-800 m above the summit for most of the month. As a result of the decrease in activity, PVMBG lowered the Alert Level from Level IV to Level III (on a four-level scale) on 10 February 2018. The radius of evacuation was also lowered from 6 to 4 km. A single explosion on 14 February sent an ash plume to 1,500 m above the summit. For most of March 2018, steam plumes rose less than 400 m above the summit. VONA's were issued by the Agung Volcano Observatory for ash plumes twice, on 12 March (local time) when a plume rose 800 m above the summit and drifted E, and on 26 March when the ash plume rose to 500 m and drifted NW. During much of April 2018, steam plumes rose less than 300 m above the summit; weather obscured views of the summit for most of the last week of the month. AVO issued VONA's for ash plumes on 6, 11 and 30 April; the plumes on 6 and 11 April rose 500 m and drifted W and SW respectively. The Darwin VAAC reported a series of four short-lived explosions with ash plumes on 11 April; they each dissipated within a few hours. PVMBG reported another explosion on 15 April that produced an ash plume that also rose 500 m. The plume on 30 April rose 1,500 m and drifted SW. Similar activity persisted throughout May 2018. Steam plumes generally rose 50-100 m above the summit crater each day. In addition, explosions were reported on 9, 19, and 29 May. PVMBG reported that no ash plume was observed on 9 May, due to fog obscuring the summit, but the ash plume on 19 May rose to 1,000 m above the summit and drifted SE, and the ash plume on 29 May rose 500 m and drifted SW.
Activity during June and July 2018. The volcano was covered in fog for much of the first two weeks of June. A short-lived explosion on 10 June 2018 was reported by PVMBG, but meteoric clouds obscured the summit. The Darwin VAAC noted the plume in a satellite image drifting W at about 4.6 km altitude. 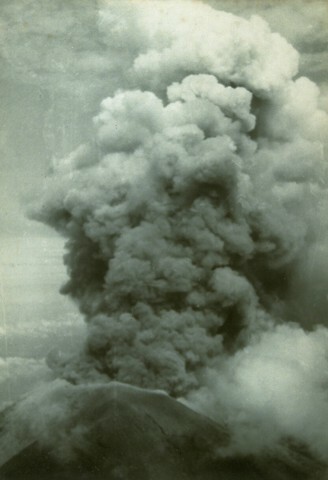 An explosion on 13 June produced an ash plume that rose 2,000 m above the summit and drifted WSW (figure 30). Another explosion was recorded on 15 June, but the summit was obscured, and no ash cloud was visible to ground observers. However, the Darwin VAAC reported the plume visible in satellite imagery at 7 km altitude (about 4 km above the summit) drifting SW and S for most of the day before dissipating. Ashfall was reported about 7 km W in the village of Puregai. PVMBG reported white and gray emissions on 17 June that rose 500 m.
Figure 30. 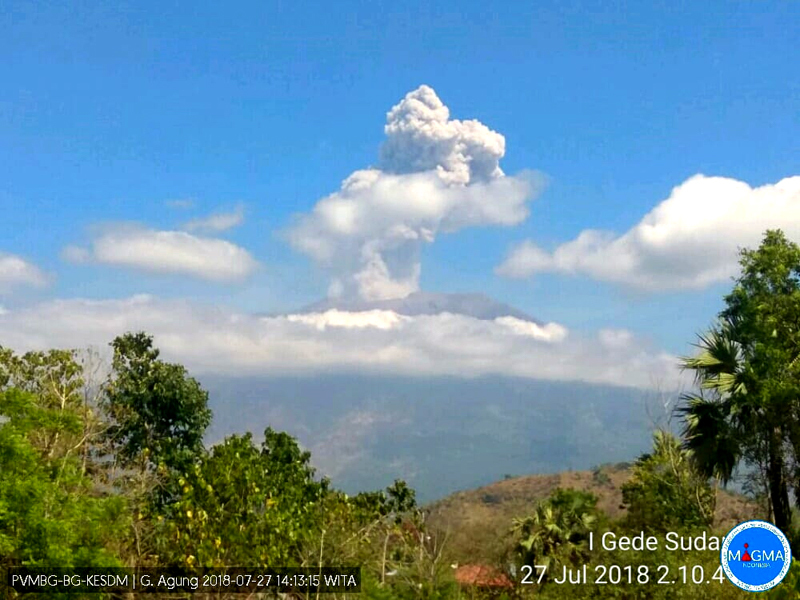 An ash plume at Agung on 13 June 2018 rose about 2,000 m above the summit and drifted WSW. 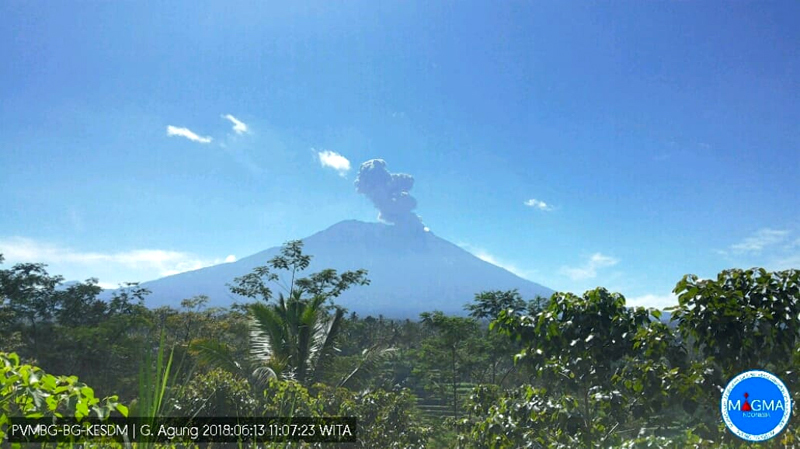 View is looking N. Courtesy of PVMBG (Information on G. Agung Eruption, 13 June 2018). An explosion during the evening (local time) of 27 June 2018 produced an ash plume that rose 2,000 m from the summit and drifted W. Another explosion the following morning produced a sustained ash cloud that lasted for several hours and again caused ashfall around the village of Puregai. It rose to about 2,000 m above the summit and drifted W and SW (figure 31). Figure 31. 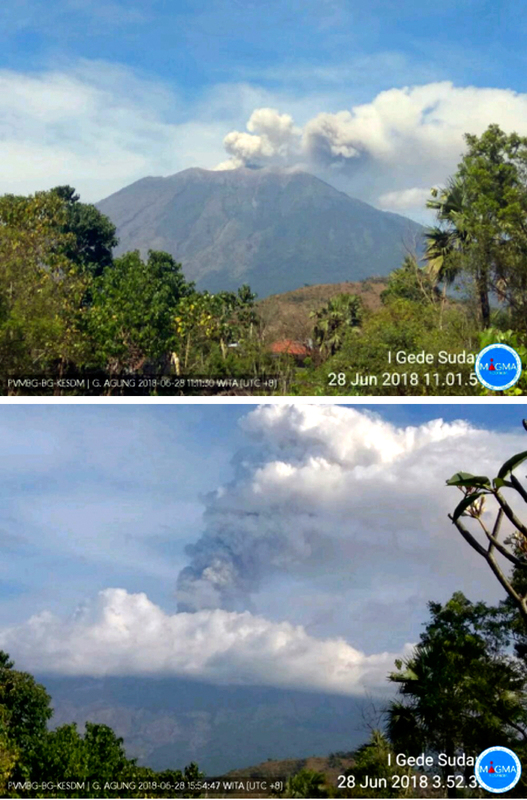 A sustained ash eruption began early on 28 June 2018 at Agung (top) and lasted well into the afternoon (bottom). Photo from a PBVBG webcam, posted on Twitter by Sutopo Purwo Nugroho‏ (BNPB). PVMBG noted in late June that inflation of 5 mm had occurred since 13 May 2018. They reported that the ash plumes on 28 June caused some airlines to cancel flights to Bali, and ashfall was reported in several villages in Bangli and areas to the W and SW the following day (figure 32). The International Gusti Ngurah Rai (IGNR) airport (60 km SW) in Denpasar, the Blimbing Sari Airport (128 km W) in Banyuwangi, and the Noto Hadinegoro Airport (200 km W) in Jember closed for portions of the day on 29 June (ANTARA News). Figure 32. Settlement and plantation areas were coated with ash from Mount Agung in Pemuteran Village (10 km W) on 29 June 2018. Courtesy of Tempo.com and ANTARA/Nyoman Budhiana. Incandescence overnight on 28-29 June indicated fresh effusions of lava at the summit; they were accompanied by ash emissions that rose 1,500-2,500 m. Thermal satellite images recorded on 29 June indicated significant hotspots within the crater with thermal energy reaching 819 Megawatts; this was the largest amount of thermal energy recorded during the 2017-2018 activity, significantly higher than the maximum recorded of 97 Megawatts reached at the end of November 2017. The MIROVA data clearly reflected the sudden surge of thermal energy into the summit crater at the end of June (figure 33). The Darwin VAAC reported continuous emissions of ash beginning on 28 June that drifted to the W for over 24 hours. The height was initially reported by ground observers at 3.7 km altitude but was raised to 7 km altitude a few hours later, based on satellite imagery and pilot reports. By late that day, an upper plume (at 7 km) drifted SW and a second plume drifted W at 5.5 km altitude. By late on 29 June the continuous ash plume was drifting NW at 4.9 km altitude; it finally dissipated early on 30 June. In addition to large ash plumes and a major thermal anomaly, a substantial SO2 plume also emerged from Agung on 28-29 June 2018. The plume drifted W over Java and then dispersed to the NW over the next 24 hours (figure 34). A lingering, smaller plume was still visible two days later. Figure 34. A substantial SO2 plume was released from Agung during 28-29 June 2018 and captured by both the OMPS instrument on the Suomi satellite (upper images) and the OMI instrument on the Aura satellite (lower images). The plume first appeared on 28 June (top left) and was much larger the next day (top right). By 30 June it was dissipating over Java to the W and N (bottom left). A smaller plume drifted SW two days later (bottom right). Courtesy of NASA Goddard Space Flight Center. A series of discrete eruptions lasting from late on 30 June through 2 July 2018 produced ash plumes that rose from 3.7 to 5.5 km altitude and drifted NW and W, according to the Darwin VAAC. Effusive activity continued to increase during the first week of July 2018 with the continued growth of the lava dome in the summit crater. PVMBG reported an additional volume of lava of 4 million m3 erupted from 28 June through the middle of July bringing the size of the dome to about 27 million m3. The frequency of explosions peaked on 2 July when Strombolian activity sent incandescent ejecta 2 km from the summit in all directions (figure 35). Figure 35. The eruption of Mount Agung on 2 July 2017 produced Strombolian activity and incandescent ejecta that traveled 2 km from the summit crater in all directions. Courtesy of ANTARA News/HO/BMKG. Several VONA's issued during 2-3 July reported multiple explosions that sent ash plumes 700-2,000 m above the summit. Eighteen explosions were reported by PVMBG between 1 and 8 July. 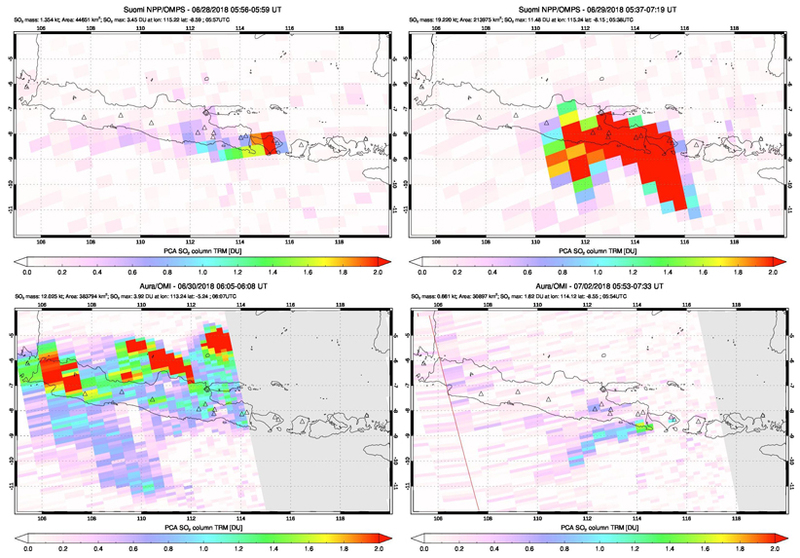 The Darwin VAAC noted a substantial explosion early on 2 July that produced a plume that rose to 7.6 km altitude and drifted W. The remains of the ash plume were discernable in satellite imagery about 250 km W of Agung by the end of the day. The ash plume on 4 July rose 2,500 m above the summit (figure 36). Figure 36. 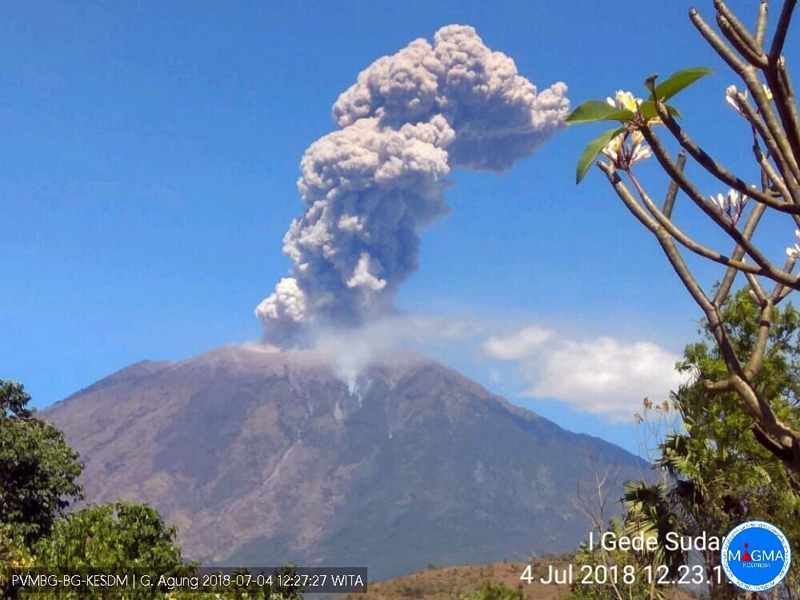 An explosion at Agung on 4 July 2018 produced an ash plume that rose 2,500 m above the summit, according to PVMBG. Courtesy of PVMBG (Information on G. Agung Eruption, July 4, 2018). Strombolian activity was reported again on 8 July 2018 (figure 37). The Darwin VAAC reported intermittent explosions every day from 3-19 July, with ash plumes rising to altitudes from 3.7 to 6.7 km. Additional explosions were reported on 21, 24, 25, and 27 July (figure 38); ash plumes rose 700-2,000 m and drifted W or SE. MODVOLC thermal alerts resumed on 27 June, and multiple daily alerts persisted on most days through the end of July. Figure 37. 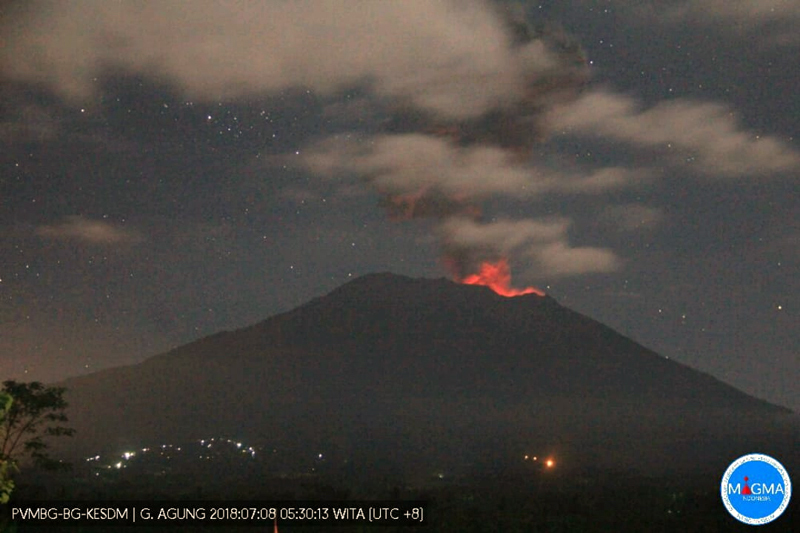 Strombolian activity at Agung recurred for the third time in 2018 on 8 July 2018. Courtesy of PVMBG (Agung Strombolian Eruption Today July 8, 2018). Figure 38. A dense ash plume rose about 2,000 m above Mount Agung on 27 July 2018 at 1406 local time. Courtesy of PVMBG (Information on G. Agung Eruption, 27 July 2018). Information Contacts: Pusat Vulkanologi dan Mitigasi Bencana Geologi (PVMBG, also known as Indonesian Center for Volcanology and Geological Hazard Mitigation, CVGHM), Jalan Diponegoro 57, Bandung 40122, Indonesia (URL: http://www.vsi.esdm.go.id/); MAGMA Indonesia, Kementerian Energi dan Sumber Daya Mineral (URL: https://magma.vsi.esdm.go.id/); Darwin Volcanic Ash Advisory Centre (VAAC), Bureau of Meteorology, Northern Territory Regional Office, PO Box 40050, Casuarina, NT 0811, Australia (URL: http://www.bom.gov.au/info/vaac/); MIROVA (Middle InfraRed Observation of Volcanic Activity), a collaborative project between the Universities of Turin and Florence (Italy) supported by the Centre for Volcanic Risk of the Italian Civil Protection Department (URL: http://www.mirovaweb.it/); Hawai'i Institute of Geophysics and Planetology (HIGP) - MODVOLC Thermal Alerts System, School of Ocean and Earth Science and Technology (SOEST), Univ. of Hawai'i, 2525 Correa Road, Honolulu, HI 96822, USA (URL: http://modis.higp.hawaii.edu/); NASA Goddard Space Flight Center (NASA/GSFC), Global Sulfur Dioxide Monitoring Page, Atmospheric Chemistry and Dynamics Laboratory, 8800 Greenbelt Road, Goddard, Maryland, USA (URL: https://so2.gsfc.nasa.gov/); Sutopo Purwo Nugroho?, BNPB, Twitter (URL: https://twitter.com/Sutopo_PN); TEMPO.CO, Tempo Building, Jl. Palmerah Barat No. 8, South Jakarta 12210, Indonesia (URL: https://nasional.tempo.co/read/1102118/pvmbg-energi-thermal-erupsi-gunung-agung-kali-ini-paling-besar); ANTARANEWS.com, ANTARA guesthouse lt 19, Jalan Merdeka Selatan No. 17, Jakarta Pusat, Indonesia, (URL: https://en.antaranews.com). PVMBG reported that at 1331 on 4 April an explosion at Agung ejected incandescent material out of the crater and onto the flanks within a 2-3 km radius, mainly on the S flank. 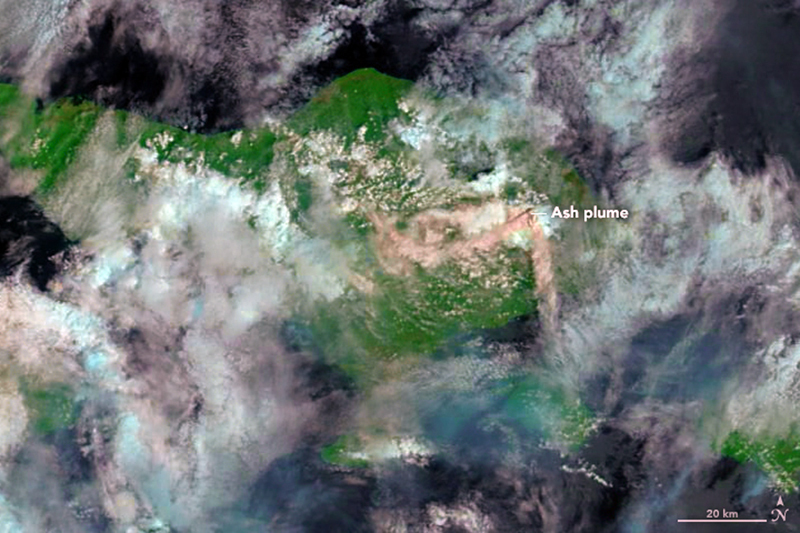 A dense gray ash plume rose 2 km above the crater rim and, based on satellite data, drifted W and S. Ashfall was reported in areas downwind including Telungbuana, Badeg, Besakih (7 km SW), Pempatan (8 km W), Teges, and Puregai. Roaring was heard at the observation post in Rendang (12 km NW). The Alert Level remained at 3 (on a scale of 1-4) with the exclusion zone set at a 4-km radius. At 1825 on 28 March an ash plume from Agung rose above the crater to an altitude of 5.5 km (18,000 ft) a.s.l. and drifted NW according to PVMBG and the Darwin VAAC. A thermal anomaly was visible in satellite data. 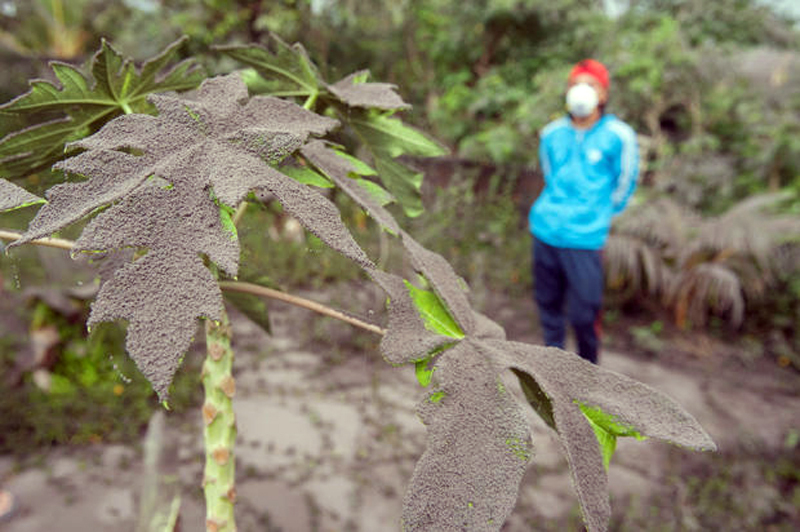 Ashfall was reported in nearby villages. The Alert Level remained at 3 (on a scale of 1-4) with the exclusion zone set at a 4-km radius. PVMBG reported that at 0018 on 21 March an event at Agung was recorded for 1 minute and 47 seconds by the seismic network. Weather conditions prevented visual observations of the summit. The Alert Level remained at 3 (on a scale of 1-4) with the exclusion zone set at a 4-km radius. 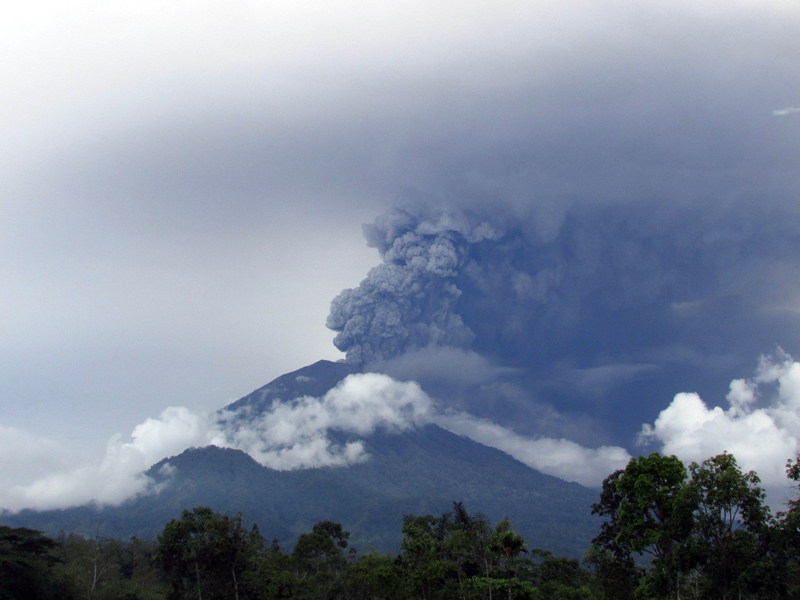 PVMBG reported that at 1631 on 22 February an event at Agung generated an ash plume that rose 700 m and drifted E. The Alert Level remained at 3 (on a scale of 1-4) with the exclusion zone set at a 4-km radius. PVMBG reported that an explosive event at Agung was recorded at 0434 on 14 February, causing ashfall in Bugbug village, 20 km SE. Crater incandescence was recorded at night by webcams in Karangasem City (16 km SE). The Alert Level remained at 3 (on a scale of 1-4) with the exclusion zone set at a 4-km radius. 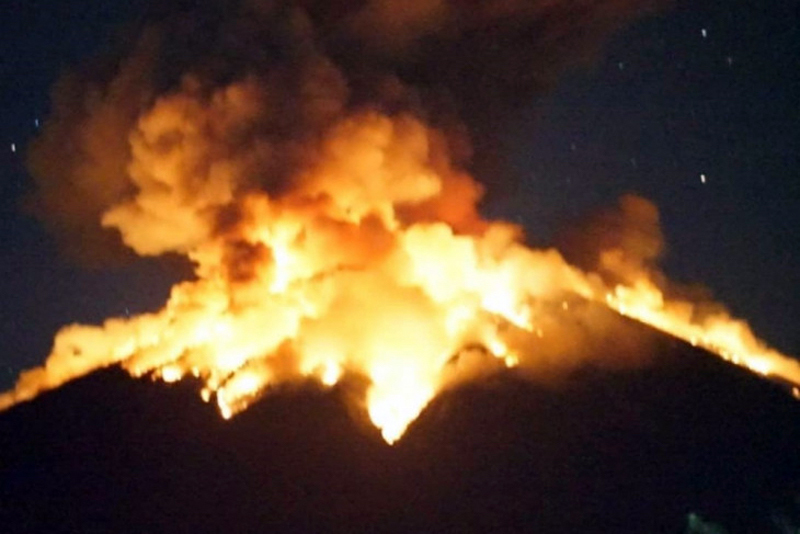 PVMBG reported that a 97-second-long explosive event at Agung began at 0012 on 8 February. A plume was not visible, though webcams recorded crater incandescence. The Alert Level remained at 3 (on a scale of 1-4) with the exclusion zone set at a 4-km radius. According to the Darwin VAAC, a webcam recorded a diffuse ash emission from Agung rising to an altitude of 3.3 km (11,000 ft) a.s.l. and drifting W on 17 August. The Alert Level remained at 3 (on a scale of 1-4) and the exclusion zone was stable at a 4-km radius. According to the Darwin VAAC, a webcam recorded an ash emission from Agung rising to an altitude of 4.3 km (14,000 ft) a.s.l. and drifting W. The Alert Level remained at 3 (on a scale of 1-4) with the exclusion zone set at a 4-km radius. PVMBG reported that white plumes rose 100-300 m above Agung’s crater rim during 1 and 2-7 August. The Alert Level remained at 3 (on a scale of 1-4) with the exclusion zone set at a 4-km radius. 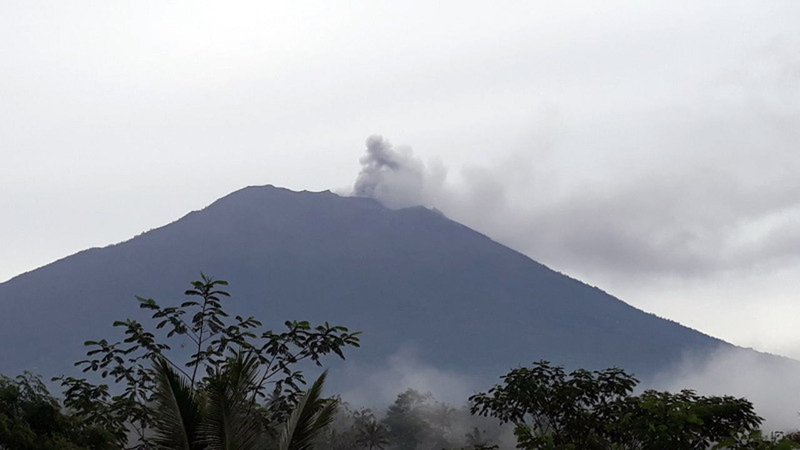 According to PVMBG a ground-based observer reported that at 0041 on 25 July an event at Agung produced a dense ash-and-gas plume that rose 700 m and drifted E and SE. Seismic data recorded the event for two minutes and 15 seconds. At 1406 on 27 July an event lasting one minute and 32 seconds produced a dense ash-and-gas plume that rose 2 km and drifted W. The Alert Level remained at 3 (on a scale of 1-4) and the exclusion zone was stable at a 4-km radius. PVMBG reported that plumes rose 200-500 m above Agung’s crater rim on 18, 20, and 23 July. Gray plumes rose as high as 1.5 km on 22 July. The Alert Level remained at 3 (on a scale of 1-4) and the exclusion zone was stable at a 4-km radius. PVMBG reported that an event at 1409 on 13 July generated an ash plume that rose 1.5 km above Agung’s crater rim and drifted W. An event was detected at 0452 on 15 July, though no ash was visible. An ash plume from an event at 0905 rose 1.5 km and drifted W and SE. The Alert Level remained at 3 (on a scale of 1-4) and the exclusion zone was unchanged at a 4-km radius. 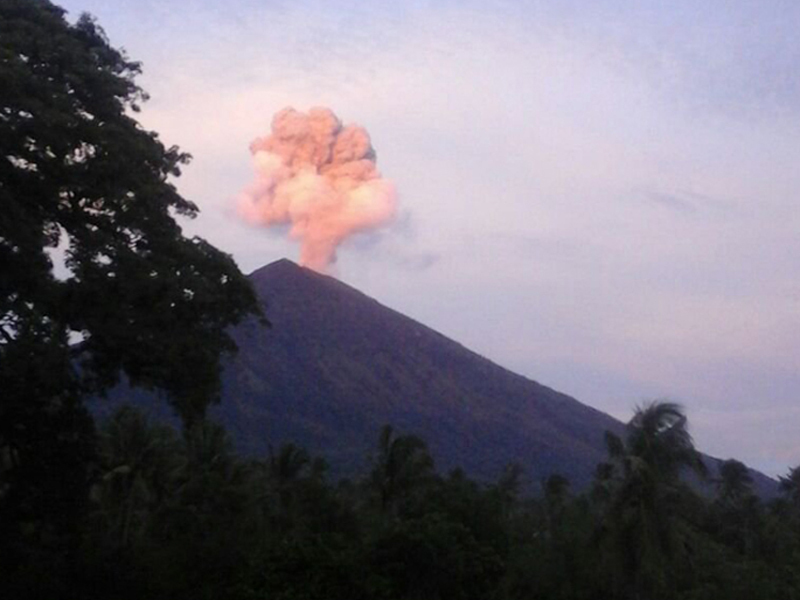 PVMBG reported that the eruption at Agung continued during 4-10 July. Sulfur dioxide flux was 1,400-2,400 tons/day on 3 July and 400-1,500 tons/day on 4 July. Satellite data acquired on 4 July indicated continuing lava effusion in the crater, with 4-5 million cubic meters effused in the past week. At 1220 an ash plume rose 2.5 km above the crater rim and drifted W. An event was detected at 2216, though an ash plume was not visible possibly due to poor viewing conditions. At 0047 on 5 July an ash plume rose at least 1 km and drifted W, and an event at 1633 produced an ash plume that rose 2.8 km and drifted E and W. A small event was detected on 6 July. According to BNPB a third Strombolian event occurred at 0522 on 8 July, generating an ash plume that rose 2 km. They noted that 4,415 evacuees were housed in 54 evacuation centers. An ash plume rose from the crater at 1120 on 9 July and drifted W. The Alert Level remained at 3 (on a scale of 1-4) and the exclusion zone was stable at a 4-km radius. PVMBG reported that seismicity at Agung continued to be dominated by low-frequency events. The number of earthquakes increased from 15/day on 25 June to 69/day on 28 June; harmonic tremor emerged on 27 June, and at 2221 an event generated an ash plume that rose 2 km above the crater rim and drifted W. Gas-and-ash emissions were continuous during 28-29 June, rising around 2 km and drifting W and SW, and incandescence was reflected in the plume; satellite data confirmed that high-temperature (1,200 degrees Celsius) lava flowed onto the crater floor. The intensity of the thermal anomaly on 29 June was the largest recorded at Agung since the beginning of the eruption on 21 November 2017. BNPB noted that the ash plumes on 28 June caused some airlines to cancel flights to Bali, and ashfall was reported in several villages on Bangli. The International Gusti Ngurah Rai (IGNR) airport (60 km SW) in Denpasar, the Blimbing Sari Airport (128 km W) in Banyuwangi, and the Noto Hadinegoro Airport (200 km W) in Jember closed for portions of the day on 29 June. Lava continued to effuse, and by 1 July the estimated volume of new lava was 4-5 million cubic meters making the total volume erupted since 21 November 2017 around 27-28 million cubic meters (50% of the total crater volume). The height difference between the lowest part of the crater rim (SW side) and the highest part of the lava surface (in the center of the crater) was 85-90 m. Satellite data showed that the intensity of the thermal anomaly decreased during 28 June-2 July, though still remained at a high level. At 2104 on 2 July an explosion generated an ash plume that rose 7-9 km above the crater rim, and ejected incandescent lava as far as 2 km onto the flanks. News articles noted that the deposits caused forest fires on the upper flanks, and that the event prompted about 700 people to evacuate. An event at 0413 on 3 July generated an ash plume that rose around 2 km. The Alert Level remained at 3 (on a scale of 1-4) and the exclusion zone was stable at a 4-km radius. PVMBG reported that at 1105 on 13 June an event at Agung produced a dense ash plume that rose around 2 km above the crater rim and drifted SW and W. Based on analysis of the seismic data, the event lasted two minutes and 12 seconds. Another event was detected at 2115 on 15 June, though foggy conditions prevented estimations of the ash plume height; ash fell in areas W, including in Puregai (7 km W). The Alert Level remained at 3 (on a scale of 1-4) and the 4-km-radius exclusion zone was unchanged. PVMBG reported that during 1 May-7 June activity at Agung remained at a relatively high level. Emissions were mostly water vapor, occasionally with ash. In general, tiltmeter and GPS showed long-term deflation since December 2017, though inflation began to be detected the second week of May; deformation analysis indicated that magma continued to accumulate about 3-4 km below the crater. Low- and high-frequency earthquakes also suggested rising magma. Sulfur dioxide flux was 190-203 tons/day, and thermal anomalies in the crater were identified in satellite data. The erupted volume of lava was estimated to be 23 million cubic meters, equivalent to about a third of the total crater volume. At 2214 on 10 June an event generated an ash plume that drifted W at an unspecified altitude. The Alert Level remained at 3 (on a scale of 1-4) and the exclusion zone was stable at a 4-km radius. PVMBG reported that at 1719 on 19 May an event at Agung generated an ash plume that rose 1 km above the crater rim and drifted SE. The Alert Level remained at 3 (on a scale of 1-4) and the exclusion zone continued at a 4-km radius. PVMBG reported that at 2245 on 30 April an event at Agung generated an ash plume that rose 1.5 km above the crater rim and drifted SW. Seismicity was dominated by low-frequency earthquakes related to gas-and-steam emissions. The Alert Level remained at 3 (on a scale of 1-4) and the exclusion zone continued at a 4-km radius. PVMBG reported that although there were often foggy conditions during 18-24 April, white plumes were observed rising as high as 300 m above Agung’s crater rim and drifting E. The Alert Level remained at 3 (on a scale of 1-4) and the exclusion zone continued at a 4-km radius. 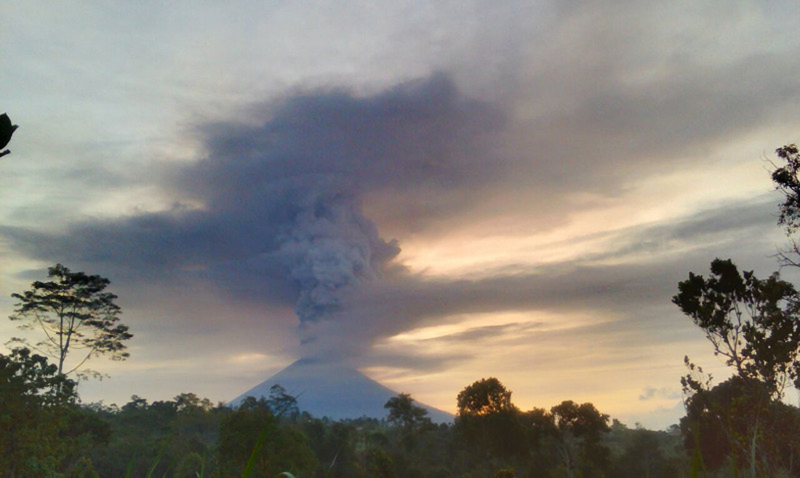 Based on webcam views, satellite data, and ground-based observations, the Darwin VAAC reported that on 11 April an event at Agung generated an ash plume that rose to an altitude of 3.7 km (12,000 ft) a.s.l. and drifted SW.
PVMBG reported that an event at Agung at 1737 on 5 April generated an ash plume that rose 500 m above the crater rim and drifted W. Seismicity was dominated by high- and low-frequency earthquakes. The Alert Level remained at 3 (on a scale of 1-4) and the exclusion zone continued at a 4-km radius. 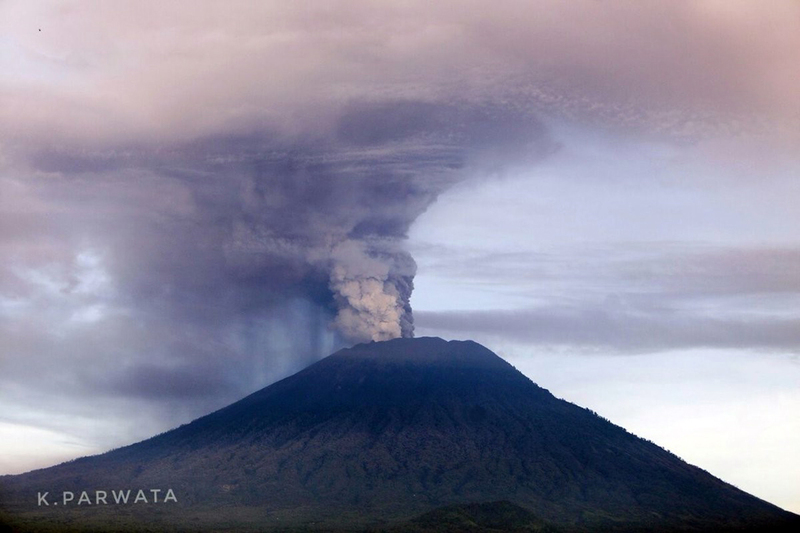 In a VONA, PVMBG reported that at 1009 on 26 March an event at Agung generated an ash plume that rose at least to an altitude of 3.6 km (11,650 ft) a.s.l. and drifted NW. The Alert Level remained at 3 (on a scale of 1-4) and the exclusion zone continued at a 4-km radius. PVMBG reported that on 28 February gray-white plumes rose as high as 300 m above Agung’s crater rim. During 1-5 March white plumes rose as high as 500 m above the crater rim. The Alert Level remained at 3 (on a scale of 1-4) and the exclusion zone continued at a 4-km radius. PVMBG reported that an event at Agung recorded at 1149 on 13 February generated an ash plume that rose to an altitude of 4.5 km (14,900 ft) a.s.l. and drifted E. The Alert Level remained at 3 (on a scale of 1-4) and the exclusion zone continued at a 4-km radius. On 10 February PVMBG reported that activity at Agung had declined during the previous month or two leading the observatory to lower the Alert Level to 3 (on a scale of 1-4) and adjusted the exclusion zone to a 4-km radius. The report noted that the tallest eruption plume in January was 2.5 km above the crater rim, occurring on 19 January, and the last event on 24 January generated a plume that rose 1 km. The volume of erupted lava was an estimated 20 million cubic meters in December 2017, and had not significantly changed. Seismicity continued to fluctuate, though the number and magnitude of events had declined. Satellite data showed a decrease in thermal output reflective of a reduced lava flow rate. PVMBG warned that activity at Agung is still high and unstable; tiltmeter data showed low rates of inflation (GPS patterns were stable) and gas-emission data indicated magma movement at depth, though at a lower intensity compared to values measured at the end of November 2017. An event at 1149 on 13 February generated as ash plume that rose 1.5 km above the crater rim. PVMBG reported that white-and-gray plumes rose as high as 1 km above Agung’s crater rim during 24-25 January. Foggy conditions prevented visual observations of the crater during 26-30 January. The Alert Level remained at 4 (on a scale of 1-4) and the exclusion zone continued at a 6-km radius. PVMBG reported that the eruption at Agung continued during 17-23 January, with gas-and-steam plumes rising from the crater punctuated by occasional ash emissions. An event at 2126 on 17 January generated a plume that rose 1.5 km above the crater rim and drifted E. An event was recorded at 1944 on 18 January, though fog prevented confirmation of a plume. At 1920 on 19 January a Strombolian event produced an ash plume that rose as high as 2.5 km and drifted E, and ejected incandescent material as far as 1 km from the crater. Incandescence emanated from the crater for about two hours after the event. White-to-gray plumes rose 500 m during 22-23 January. The Alert Level remained at 4 (on a scale of 1-4) and the exclusion zone continued at a 6-km radius. PVMBG reported that during 10-16 January gray-and-white plumes generally rose as high as 500 m above Agung’s crater rim and drifted S, SE, and E. An event at 1754 on 11 January produced an ash plume that rose 2.5 km above the crater rim and drifted NE (likely causing ashfall in areas downwind), and another event at 0723 on 15 January generated an ash plume that rose 2 km. As of 11 January BNPB estimated that 53,207 evacuees were spread out in 233 shelters. The Alert Level remained at 4 (on a scale of 1-4) and the exclusion zone continued at a 6-km radius. BNPB reported that activity at Agung continued to fluctuate at a high level. Visual observations as well as seismic, deformation, and geochemistry data indicated that the eruption was continuing, though deformation data in recent days showed a stagnant trend. As of the morning of 4 January BNPB noted that there were 70,610 evacuees spread out in 240 shelters. The exclusion zone was adjusted to 6 km in all directions that same day, allowing thousands of displaced people the option to return to their homes. An estimated 17,115 people in seven villages have residences within the 6-km-radius exclusion zone. PVMBG reported that during 3-9 January gray-and-white plumes rose as high as 2 km above the crater rim and drifted in multiple directions. The Alert Level remained at 4 (on a scale of 1-4). PVMBG reported that during 27 December 2017-2 January 2018 gray-and-white plumes rose as high as 2 km above Agung’s crater rim and drifted W, SW, and E. Incandescence from the crater was often observed at night. Ash fell in several local villages including Badeg, Yeha, Temukus, Besakih (11 km WSW), and Muncan (12 km SW) on 1 January, and Rendang post on 2 January. The Alert Level remained at 4 (on a scale of 1-4), and the exclusion zones continued at a general 8-km radius and 10 km in the NNE, SE, S, and SW directions. PVMBG reported that during 20-26 December gray-and-white plumes rose as high as 2 km above Agung’s crater rim and drifted W and E; weather clouds and fog sometimes prevented visual observations. Incandescence from the crater was sometimes observed at night. BNPB reported that during 22-23 December events generated dense gray ash plumes that rose as high as 2.5 km above the crater rim and drifted NE. Ash fell on the flanks and in Tulamben, Kubu. As of 25 December there were 71,045 evacuees spread out in 239 shelters. The Alert Level remained at 4 (on a scale of 1-4), and the exclusion zones continued at a general 8-km radius and 10 km in the NNE, SE, S, and SW directions. PVMBG reported that during 13-19 December gray-and-white plumes rose as high as 2.5 km above Agung’s crater rim and drifted W, N, and E; weather clouds and fog sometimes prevented visual observations. Incandescence from the crater was sometimes observed at night. The Alert Level remained at 4 (on a scale of 1-4), and the exclusion zones continued at a general 8-km radius and 10 km in the NNE, SE, S, and SW directions. BNPB posted two map-view images of Agung, one from 20 October showing pre-eruptive conditions and one from 16 December showing the lava that had erupted onto the crater floor, noting that about 1/3 of the crater had been filled with an estimated 20 million cubic meters of lava. 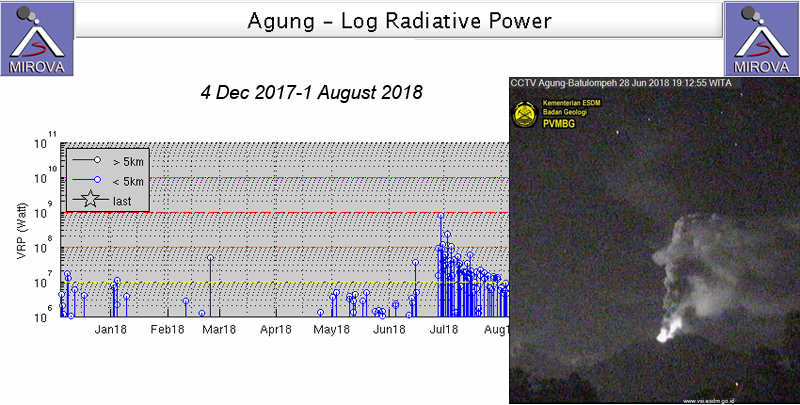 Based on BNPB and PVMBG reports, the eruption at Agung continued during 6-12 December, with high seismicity and nighttime crater incandescence often visible. On 8 December at 0759 an event generated a dense ash plume that rose 2.1 km above the crater rim and drifted W. Minor amounts of ash were deposited on the flanks, and lapilli was reported in Temakung. An ash plume rose 3 km at 1457. The number of evacuees on 10 December was 70,079 (spread out in 237 shelters). Ash plumes rose as high as 2 km. 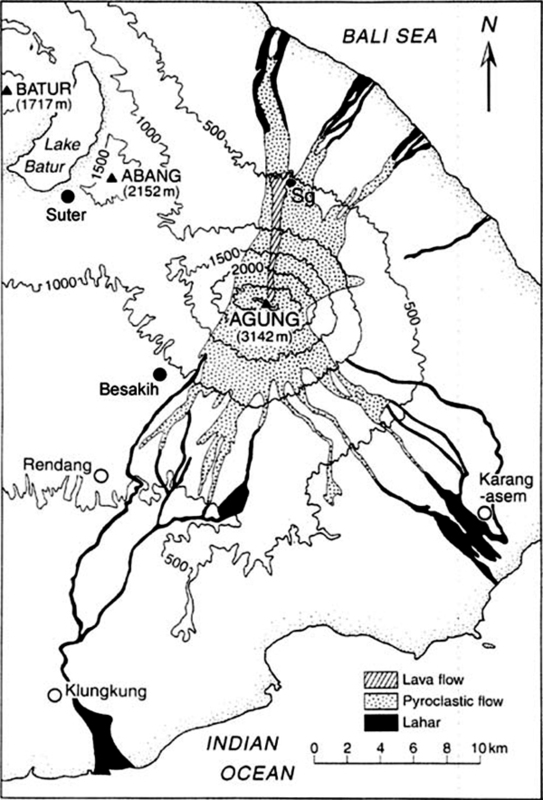 Lahars were observed in a drainage originating on the flanks of Agung. An explosion at 0549 on 11 December generated a dense ash plume that rose 2.5 km and drifted W and NW. Multiple ash-plume events were observed during 11-12 December, with plumes rising 1.5 km above the crater rim. The Alert Level remained at 4 (on a scale of 1-4), and the exclusion zones continued at a general 8-km radius and 10 km in the NNE, SE, S, and SW directions. 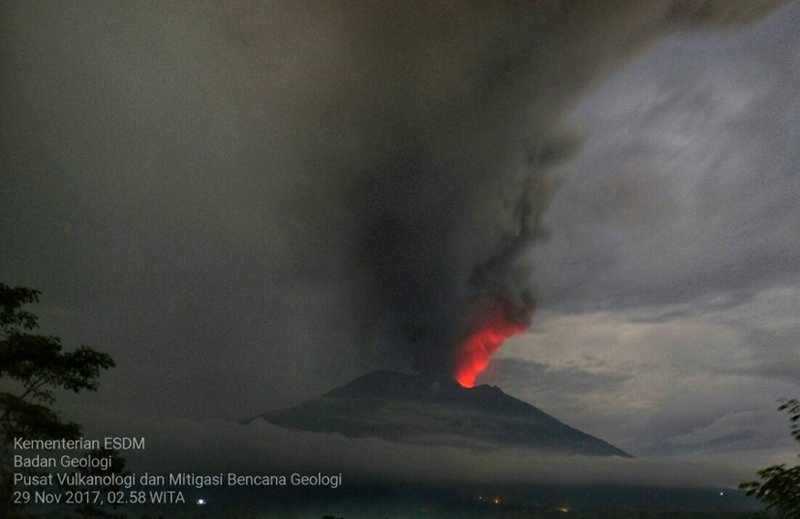 PVMBG reported that the eruption at Agung, which began on 21 November, continued during 30 November-5 December. On 29 November gray ash plumes levels were rising to 2 km above the crater rim, resulting in ashfall to the SE. During 30 November-5 December emissions continued to rise 2 km; most were white in color, but dense gray ash emissions were noted during 1-2 December. Satellite data indicated that lava effusion continued at least through 1 December, and the erupted volume of lava was estimated to be 20 million cubic meters, equivalent to about a third of the total crater volume. The base of the plume was often reddish during 29 November-5 December reflecting incandescence from lava in the crater. BNPB noted on 5 December that 63,885 evacuees were distributed in 225 evacuation shelters. Lahars were first noted on 21 November and continued to be observed through 5 December. The lahars flowed down drainages on the S flank (along the Tukad Yehsa, Tukad Sabuh, and Tukad Beliaung drainages) and also down the Tukad Bara drainage on the N flank, impacting houses, roads, and agricultural areas. The Alert Level remained at 4 (on a scale of 1-4), and the exclusion zones continued at a general 8-km radius and 10 km in the NNE, SE, S, and SW directions. 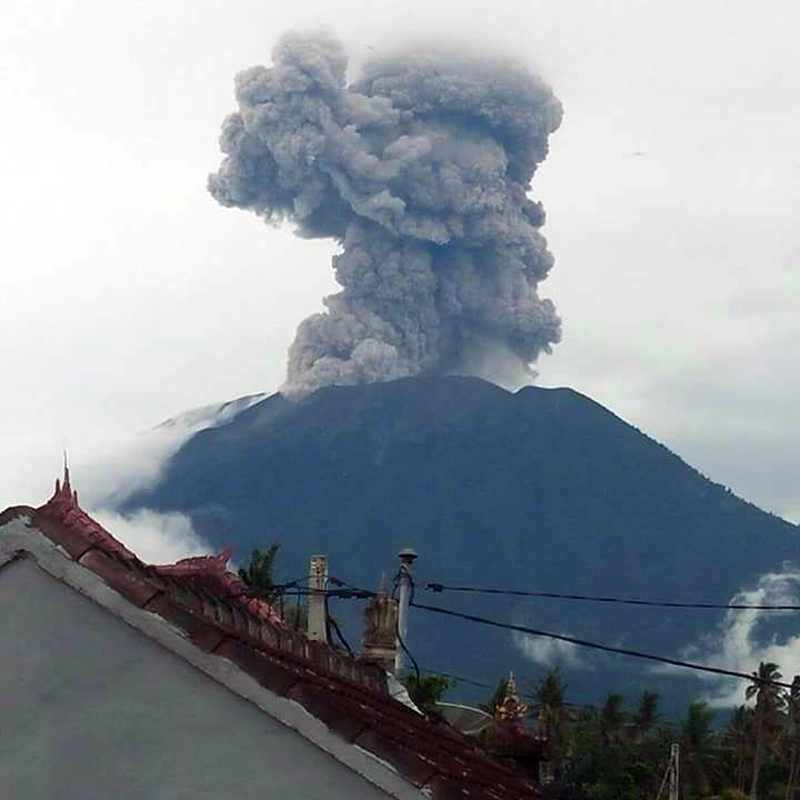 PVMBG reported that a phreatic eruption at Agung began at 1705 on 21 November, following a low-frequency tremor signal. An ash plume rose 700 m above the crater rim and drifted ESE. The Alert Level remained at 3 (on a scale of 1-4), and the exclusion zones remained intact (at 6 km, and an additional expansion to 7.5 km in the NNE, SE, S, and SW directions). PVMBG reported that white plumes from Agung rose as high as 500 m above the crater rim during 8-14 November. The Alert Level remained at 3 (on a scale of 1-4), and the exclusion zones remained intact (at 6 km, and an additional expansion to 7.5 km in the NNE, SE, S, and SW directions). On 29 October PVMBG lowered the Alert level for Agung to 3 (on a scale of 1-4), noting a decline in activity, especially since 20 October. The thermal anomaly in the crater identified in satellite data was less intense in October than in September. Beginning on 20 October GPS data showed a slower deformation rate. Seismic signals decreased in number and amplitude, though low-frequency events continued to indicate magma movement. White fumarolic plumes rose as high as 500 m above the crater rim during 20-29 October; a comparison of video taken by drones on 20 and 29 October showed a relative decrease in the intensity of fumarolic emissions. BNPB stated that, despite the decreased Alert Level, the exclusion zones remained intact (at 6 km, and an additional expansion to 7.5 km in the NNE, SE, S, and SW directions). The number of evacuees was 133,457 (spread out in 385 shelters). PVMBG reported that although foggy conditions at Agung occasionally prevented visual observations, during 18-24 October dense white plumes were seen rising as high as 500 m above the crater rim. Seismicity fluctuated but remained high, though BNPB reported that overall seismicity had decreased. According to BNPB a team launched a drone on 19 October and were able to capture video of the fumarolic emissions from several vents and cracks in the crater. The Alert Level remained at 4 (the highest level on a scale of 1-4) with the exclusion zone at 9 km, and an additional expansion to 12 km in the SE, S, and SW directions. PVMBG reported that although foggy conditions at Agung sometimes prevented visual observations, during 11-17 October dense white plumes were seen rising 200 m above the crater rim. On 14 October BNPB stated that seismicity remained high; PVMBG noted that seismicity was dominated by shallow volcanic events, and the number of volcanic earthquakes remained steady. The governor of Bali extended the state of emergency to 26 October, noting that the Alert Level remained at 4 (the highest level on a scale of 1-4). The number of evacuees was 139,199 (spread out in 389 shelters). On 5 October PVMBG reported that the rate of volcanic earthquakes at Agung had not increased during the previous 12 days, but continued to fluctuate at a high level. The seismic network detected 1-3 earthquakes per minute on average, with a total more than 600 events per day. The number of shallow volcanic earthquakes increased to 200 per day during 24 September-5 October, possibly indicating that magmatic activity at shallow depths was still high. The number of earthquakes felt by staff at the Mt. Agung Volcano Observatory in Rendang village, 12.5 km SSW, peaked on 27 September and then decreased afterwards. Gas plumes rose 50-200 m above the crater rim. Satellite data indicated an area of water expulsion near the solfatara field on the crater floor thought to reflect a disturbance to the hydrologic system in response to intruded magma at depth. On 5 October BNPB reported that the number of evacuees reached 146,797 (spread out in 427 shelters), though about 28 villages (70,000 people) were located within the evacuation zone. About 10,000 farm animals had also been evacuated. On 7 October a white plume likely composed mostly of water vapor rose 1.5 km above the crater rim and slowly drifted E. During 8-10 October fumarolic plumes rose 50-200 m above the rim. The Alert Level remained at 4 (the highest level on a scale of 1-4) with the exclusion zone at 9 km, and an additional expansion to 12 km in the SE, S, and SW directions. On 29 September PVMBG reported that earthquakes at Agung were becoming stronger with more felt by local residents, and larger ones felt in areas 45-55 km SW including Denpasar and Kuta. Fumarolic emissions were identified in satellite data, as well as hot areas on the crater floor that had enlarged over the previous week. A new fracture on the crater floor emitted steam. After a M 4.2 earthquake was detected at 1627 on 26 September emissions intensified and rose 500 m above the crater rim. On 4 October BNPB reported that seismicity continued to fluctuate at high levels, and weak emissions rose above the crater rim. The number of evacuees reached 141,213 (spread out in 416 shelters) from 78 villages, though about 2,600 in locations outside of the evacuation zone were returning home; there were 28 villages (about 70,000 people) within the evacuation zone. The Alert Level remained at 4 (the highest level on a scale of 1-4) with the exclusion zone at 9 km, and an additional expansion to 12 km in the SE, S, and SW directions. BNPB noted that as of 1300 on 22 September there were 9,421 people displaced from the evacuation zones at Agung. Seismicity continued to increase, therefore later that day on 22 September PVMBG raised the Alert Level to 4 (the highest level on a scale of 1-4) and expanded the exclusion zone to 9 km, with an additional expansion to 12 km in the SE, S, and SW directions. On 24 September BNPB reported that the number of evacuees continued to grow, as residents were leaving the expanded evacuation zones; there were 34,931 people in 238 shelters. The report noted that some people were returning home in the daytime to feed their livestock. On 27 September the number of evacuees reached 96,086 (spread out in 430 shelters), seismic activity continued to escalate, and diffuse white plumes rose 50 m above the crater rim. Increased seismicity at Agung, as well as the severity of past eruptions, prompted PVMBG to raise the Alert Level to 2 (on a scale of 1-4). The report noted that volcanic earthquakes (VA) began to be recorded on 10 August and shallow volcanic earthquakes (VB) began to be recorded on 24 August. Local tectonic earthquakes were also recorded and began to increase consistently on 26 August. PVMBG warned the public to stay at least 3 km away from the crater. On 13 September a climber observed a sulfatara plume rising from the bottom of the crater as high as 50 m above the crater rim. During 14-18 September four earthquakes centered around Agung were felt. On 18 September PVMBG reported that the number of VA and VB events continued to increase; the Alert Level was increased to 3. The exclusion zone was increased to 6 km, with an additional expansion to 7.5 km in the N, SE, and SSW directions. Elevations above 950 m were also restricted. A VEI 5 eruption during 1963-64 produced pyroclastic flows and lahars that caused extensive damage and resulted in more than 1,100 deaths. Fumarolic and solfataric activity (restricted to the crater) emitted a thin white plume periodically seen from the observatory. In late July, 69 tectonic, three volcanic A-type, and six volcanic B-type events were recorded. Observations from both Rendang (S) and Budakeling (N) Observatories revealed neither white plumes from the solfatara field nor collapses of loose material from the inner crater wall. No explosion sounds from the crater have been heard. An earthquake was felt (MM I) on 9 June; 59 tectonic and two volcanic shocks [were] recorded in November. Thermal anomalies were detected by MODIS throughout 2001 and 2002 in zones proximal to the summit of Agung. The first alert occurred on 23 September 2001 when two alert-pixels were detected with a maximum alert ratio of -0.789. Larger anomalies were detected on 12 August 2002 (two alert-pixels with maximum alert ratio of -0.429) and 5 October 2002 (one alert-pixel with alert ratio of -0.536). All the alerts seem to occur outside the summit crater, with the possible exception of 5 October 2002, and are more likely to represent fires than volcanic activity. No volcanic activity has been reported recently by the Volcanological Survey of Indonesia. Information Contacts: Diego Coppola and David A. Rothery, Department of Earth Sciences, The Open University, Milton Keynes, MK7 6AA, UK. Thermal alerts courtesy of the HIGP MODIS Thermal Alerts Team (URL: http://modis.higp.hawaii.edu/). A large explosive and effusive eruption lasting about 11 months during 1963-64 at Indonesia's Mount Agung on Bali produced voluminous ashfall, devastating pyroclastic flows that caused extensive damage, and over 1,000 fatalities. The volcano remained largely quiet until renewed seismicity began in August 2017, the prelude to a new eruptive episode, which started in late November 2017 and is ongoing. Self and Rampino (2012) and Fontijn et al. (2015) published detailed summaries of historical activity at Agung prior to this new episode; a brief summary of their work is provided. Information about the new eruptive episode comes from Pusat Vulkanologi dan Mitigasi Bencana Geologi (PVMBG), also known as the Indonesian Center for Volcanology and Geological Hazard Mitigation (CVGHM), Badan Nasional Penanggulangan Bencana (BNPB) which is the National Board for Disaster Management, the Darwin Volcanic Ash Advisory Center (VAAC), and various sources of satellite data. The first two months of this new episode, through December 2017, are discussed in this report. Summary of 1963-64 eruption. The February 1963 to January 1964 eruption, Indonesia's largest and most devastating eruption of the twentieth century, was a multi-phase explosive and effusive event that produced both basaltic andesite tephra and andesite lava (Self and Rampino, 2012). After a few days of felt earthquakes on 16 and 17 February 1963, explosive activity began at the summit on 18 February. This was followed the next day by the effusion of about 0.1 km3 of andesite lava which was extruded until 17 March 1963, when a large explosive eruption generated pyroclastic density currents (PDCs) and lahars that devastated wide areas N, SW, and SE of the volcano (figure 1) (Fontijn et al, 2015). Figure 1. Map of Gunung Agung and vicinity, eastern Bali, showing the extent of the 1963 lava flow (cross-hatched), pyroclastic flow deposits (stippled), and lahar deposits (dark shading) of the 1963–1964 eruption (after unpublished map courtesy of Indonesian Volcanological Survey). Sg is Siligading village, where many fatalities occurred. Reproduced from Self and Rampino (2012, figure 3). 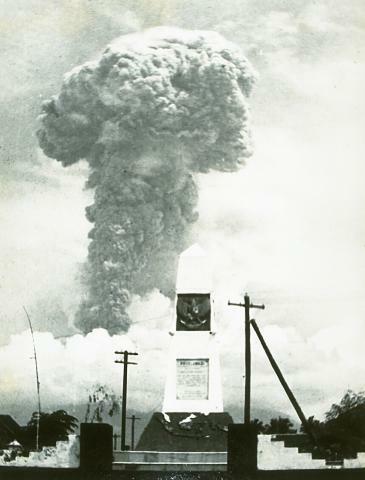 Explosive activity continued intermittently until a second explosive phase of similar intensity occurred two months later, beginning on 16 May 1963 with reported ash plumes reaching 10 km above the 3-km-high summit (figure 2). This phase produced the greatest proportion of the pyroclastic flow material from the eruption and led to additional death and destruction in villages at the foot of the volcano (Self and Rampino, 2012). Explosive outbursts continued intermittently until 17 January 1964. The total death toll of the eruption was estimated between 1,100 and 1,900 (see references in Fontijn et al., 2015). A total estimated volume of erupted magma was ca 0.4 km3 (Self and Rampino, 2012). Figure 2. 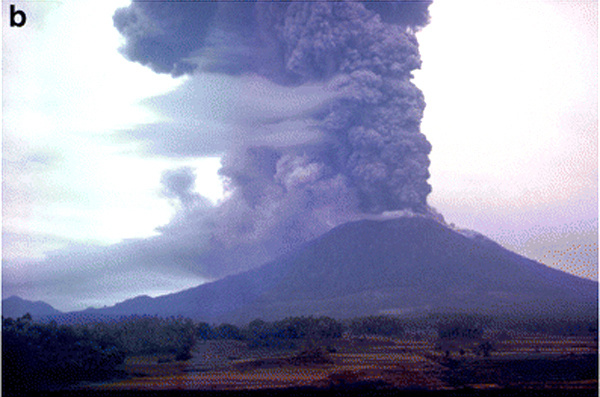 Photograph reported to be of the 16 May 1963 eruption column at Agung; the view is from the SW, perhaps near Rendang (shown on figure 1). Photo courtesy of the family of Denis Mathews, reproduced from Self and Rampino (2012, figure 2b). Activity between 1964 and 2017. Almost no activity was reported from Agung during 1964-2017. Weak solfataric activity from within the summit crater was reported in 1989 (SEAN 14:07). MODVOLC thermal alerts were reported intermittently on one or two days during a few years (2001, 2002, 2004, 2006, 2008, 2012, 2013), but all of the alerts were located on the middle or lower flanks, suggesting their source was agriculture or forest fires, unrelated to volcanic activity. Chaussard et al. (2013) reported inflation centered on the summit at a rate of 7.8 cm/year between mid-2007 and early 2009, followed by slow deflation at a rate of 1.9 cm/year until mid-2011 (the last acquired data). Summary of September-December 2017 Activity. Increases in seismic activity were first noted at Agung during mid-August 2017. Exponential increases in the rate of events during the middle of September led PVMBG to incrementally raise the Alert Level from I to IV (lowest to highest) between 14 and 22 September. Steam-and-gas emissions were intermittently observed 50-500 m above the summit crater from the end of September through October, with occasional bursts as high as 1,500 m. Seismicity dropped off almost as quickly as it rose, beginning on 20 October, and then continued a more gradual decrease through the end of the month and into November. The number and intensity of hot spots observed within the summit crater increased during September, then leveled off during October. Ash emissions first appeared on 21 November, rising to 700 m above the summit. Ash density and heights of plumes increased several times during the rest of November to about 3,000 m. Ashfall as deep as 5 mm affected neighboring communities, and was reported several hundred kilometers from the summit; the international airport about 60 km SW was forced to close for a few days at the end of the month. Thermal data indicated effusion of lava into the summit crater at the end of November. After 30 November, emissions continued, primarily comprised of steam and gas, with intermittent plumes of dense ash, rising up to 2.5 km above the summit throughout December. Activity during August-September 2017. In their monthly report of volcanic activity for August 2017, PVMBG noted that 49 volcanoes, including Agung, were listed at Alert Level 1, meaning "Normal", with no apparent increases in visual or seismic activity. The first signs of renewed unrest at Agung appeared as an increase in the rate of deep volcanic earthquakes (VA or Vulkanik Dalam) beginning on 10 August 2017. Shallow volcanic earthquakes (VB or Vulkanik Dangkal) began to increase two weeks later on 24 August, followed by an increase in the number of local tectonic earthquakes on 26 August (figure 3). Based on this increased seismicity, and an observation on 13 September of new solfataric activity at the bottom of the summit crater, PVMBG raised the Alert Level the following day from Level I (Normal) to Level II (Beware); the Aviation Color Code was raised to Yellow on a four-color scale (Green, Yellow, Orange, Red). The deeper earthquakes (VA) had a seismic amplitude range from 3-10 mm. The shallow earthquakes (VB) had an amplitude range of 2-7 mm. Otherwise, there was no surface expression of activity during September. Figure 3. Seismic activity at Agung between 1 July and 13 September 2017. The Y-axis is the number of daily earthquakes. The increase in deep volcanic seismicity (VA, or Vulkanik Dalam) that began on 10 August 2017 was followed two weeks later by an increase in shallow volcanic seismicity (Vulkanik Dangkal or VB). Courtesy of PVMBG (Peningkatan Tingkat Aktivitas Gunung Agung, 14 September 2017). The Agung Volcano Observatory (AVO) is located in Rendang village about 8 km SW. Webcams are located in Rendang and in Bukit Asah, about 8 km W. On 15 September 2017 a steam emission was observed rising 50 m above the crater rim. The AVO issued a VONA on 18 September noting a rapid increase in volcanic earthquake activity with a small hot spot detected in satellite data. This contributed to them raising the Alert Level again to Level III (Standby), resulting in a 6-km-radius exclusion zone activated around the summit, extending to 7.5 km on the N, SE, and SSW flanks where the pyroclastic flows of 1963 had caused the most damage. Many of the 50,000 village residents within the 6 km exclusion zone began voluntary evacuations. The communities affected included Jungutan (7 km S) and Buana Giri (12 km SE) villages in the Bebandem District, Sebudi Village (6 km SW) in the Selat Subdistrict, Besakih Village (12 km SW) in the Rendang Subdistrict, and Dukuh (4 km NE) and Ban (7.5 km NW) villages in the Kubu Subdistrict. About 9,500 people had voluntarily evacuated from the villages by 22 September 2017. The observatory issued another VONA on 19 September 2017, reporting an 'ash cloud' at 0255 UTC (1055 Central Indonesia Time, or WITA). It was described as a dense, white plume moving to the W. Around the same time (0240 UTC) MODVOLC recorded ten thermal alerts on the N and E flanks. Bali's Regional Disaster Management Agency (BPBD) reported in Antara News on 19 September that the source of the smoke and ash were forest fires caused by excessively dry conditions. A VONA issued by AVO in the morning of 22 September stated that a steam emission about 50 m above the summit drifted NW. During the evening of 22 September, PVMBG raised the Alert Level to Level IV (Caution), the highest of the four-level scale, based primarily on continuing increases in seismicity. They expanded the exclusion zone to 9 km around the summit, and to 12 km in the areas S, SE, and NNE. The number of evacuees had risen to nearly 35,000 people by 24 September. Steam-and-gas plumes were intermittently observed rising to 200 m above the crater rim during the rest of September. By 26 September, PVMBG reported increasing seismic activity with 579 deep volcanic (VA) quakes, 373 shallow quakes (VB), and 50 local tectonic events that day. Seismicity continued to escalate through the end of the month. By the end of September, the government was assisting with the logistics of evacuating tens of thousands of livestock, primarily cattle, as well as over 90,000 people from within and around the 9 km exclusion zone. MAGMA Indonesia reported that new steaming and thermal areas within the summit crater expanded during the last week of the month. Activity during October 2017. Narrow steam plumes rose 50-200 m above the summit crater during the first half of October. The rate of earthquakes during the last week of September and the first week of October continued to fluctuate at high levels, averaging 1-3 per minute, and more than 600 per day. By the first week of October, shallow earthquakes alone had increased to more than 200 per day, suggesting the possibility of magmatic activity at shallow depth. 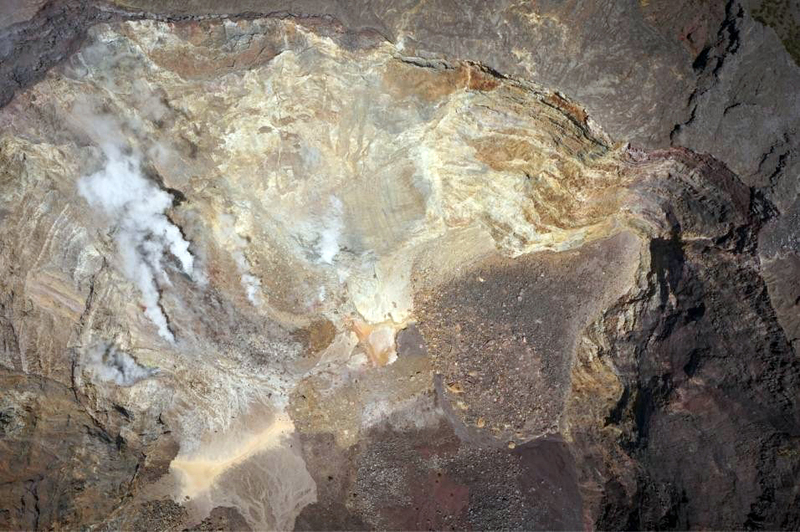 Satellite data showed increasing steam emissions along the NE edge of the crater rim. Tiltmeter data showed sudden deflation on 1 October, followed by continued inflation through 5 October. AVO released a VONA on 7 October noting a steam plume rising 1,500 m above the summit crater at 1245 UTC and drifting E (figure 4). Figure 4. A steam plume rose 1,500 m above the summit of Agung on 7 October 2017. Courtesy of PVMBG (Penurunan Status Gunungapi Agung, Bali Dari Level IV (awas) Ke Level III (siaga) Tanggal 29 Oktober 2017 Pukul 16.00 WITA). During the second half of the month, steam plumes were denser and rose more frequently to 200-500 m above the summit crater. BNPB flew drones over the summit on 20 and 29 October 2017 and captured 400 aerial photographs (figures 5 and 6). The images revealed a widening of the fracture zone on the E side of the summit crater, and a new fracture on the SE side. Figure 5. A view into the summit crater of Agung on 20 October 2017, taken by a BNPB drone. Steam fumaroles rose from the NNE flank. N is to the left. Courtesy of PVMBG (Penurunan Status Gunungapi Agung, Bali Dari Level IV (awas) Ke Level III (siaga) Tanggal 29 Oktober 2017 Pukul 16.00 WITA). Figure 6. A view into the summit crater of Agung on 29 October 2017, taken by a BNPB drone. The steam plumes rose from the NE corner of the summit crater. The NE rim of the crater slopes away to the upper left. Courtesy of PVMBG (Penurunan Status Gunungapi Agung, Bali Dari Level IV (awas) Ke Level III (siaga) Tanggal 29 Oktober 2017 Pukul 16.00 WITA). PVMBG noted a decline in seismicity beginning on 20 October 2017 which continued through the end of the month (figure 7), leading them to lower the Alert Level from IV to III on 29 October, and reduce the exclusion zone to a 6 km radius, plus a 7.5 km area in the NNE, SE and SSW sectors. In their late October report, they observed that remote sensing thermal infrared data had detected an increase in the thermal energy beginning on 10 July 2017, in the form of an increased number of hot spots within the summit crater. During August and September, the number of hot spots had increased significantly and correlated with the increases in seismicity (figure 8). The intensity of the thermal anomalies then decreased during October. Inflation resumed in mid-August and peaked in mid-September. After that, the GPS data indicated deflation at lower levels, but uplift of 6 cm occurred near the summit. The deformation rate slowed after 20 October. Figure 7. Daily seismic activity at Agung from 27 July-29 October 2017. Seismicity decreased noticeably on 20 October 2017, leading PVMBG to lower the Alert Level from IV to III on 29 October. Note that the vertical axis counting the number of daily seismic events ranges from 0 to 1,200, while in figure 3 the same axis ranges from 0 to 14. 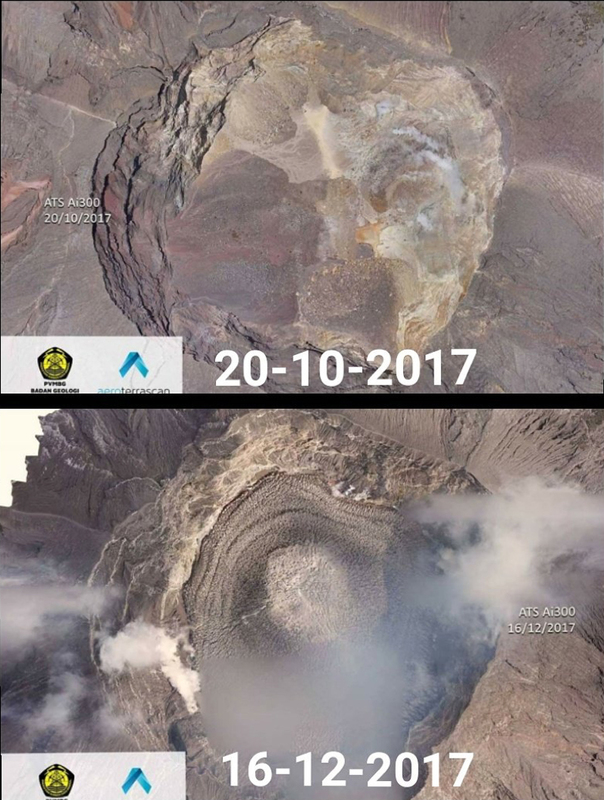 Courtesy of MAGMA Indonesia (Penurunan Status Gunungapi Agung, Bali dari Level IV (AWAS) ke Level III (SIAGA) Tanggal 29 Oktober 2017 pukul 16.00 WITA). Figure 8. 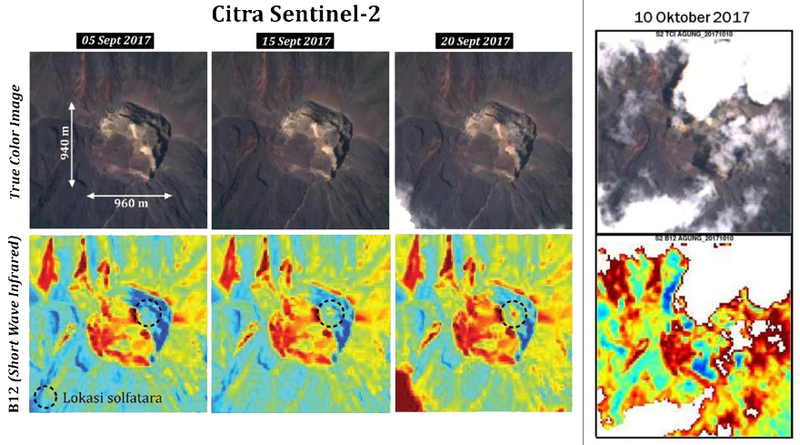 Satellite thermal imagery from Citra-Sentinel 2 revealed an increase in the number and intensity of hotspots within the summit caldera of Agung during September 2017, followed by a decrease in early October. Courtesy of PVMBG (Penurunan Status Gunungapi Agung, Bali Dari Level IV (awas) Ke Level III (siaga) Tanggal 29 Oktober 2017 Pukul 16.00 WITA). Activity during November 2017. For the first three weeks of November, dense white steam plumes rose 50-500 m above the summit crater. A VONA issued late on 11 November reported a 500-m-high steam plume. Seismicity continued at a much lower rate than during late September-October, with tens of daily events as opposed to hundreds. The first ash emission of the current eruption occurred on 21 November at 1705 local time; the plume rose to 700 m and drifted ESE (figure 9). Trace amounts of ashfall were reported in the Pidpid-Nawehkerti area about 9 km SE. At the time of the first ash emission, BNPB reported the number of evacuees living in temporary housing at about 25,000. The emission was preceded by a low-frequency tremor. Multiple volcanic ash advisories were issued by the Darwin VAAC on 21 November, although the ash was not visible in satellite imagery due to weather clouds. Continuous tremor with 2-5 mm amplitude was recorded the following three days, and ash-and-steam emissions rose 300-800 m above the summit crater. Figure 9. The first reported ash emission from Agung in 53 years rose 700 m and drifted SE on 21 November 2017. 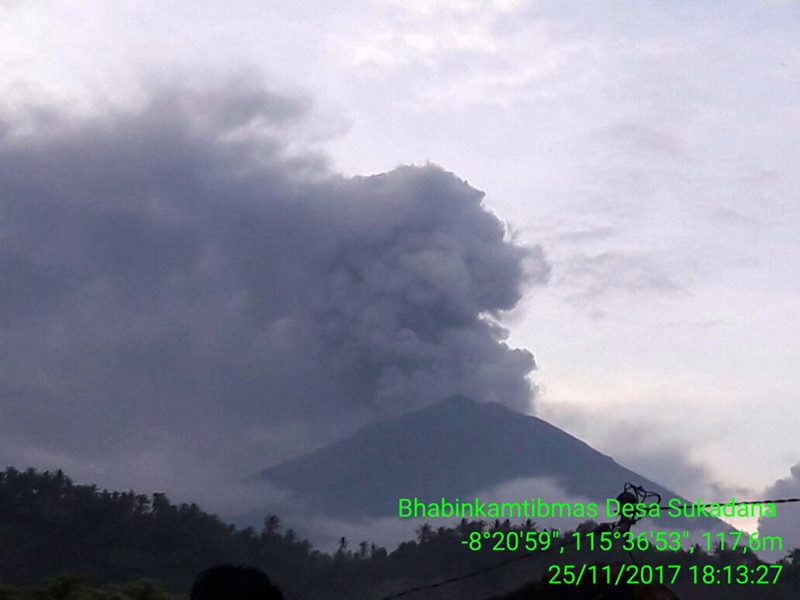 Courtesy of PVMBG (Letusan Gunung Agung Selasa, 21 November 2017 Pukul 17.05 WITA). A larger emission on 25 November sent black-gray ash plumes 2,000 m above the crater rim (figure 10) which then drifted W. The Darwin VAAC reported an ash plume visible in satellite imagery at 7.6 km altitude drifting WSW. Emissions continued later in the day, rising 4.6-6.7 km altitude and extending SE. Bright incandescence at the summit crater was observed that night. Ashfall was reported to the WSW in the villages of Menanga and Rendang (12 km SW) at the AVO Post, and also in Besakih Village, located in the upper part of Pempatan (8 km W). A number of international flights were cancelled from the I Gusti Ngurah Rai International Airport in Denpasar (60 km SW), affecting about 2,000 passengers, although the airport remained open. Figure 10. An ash emission rose at least 1,500 m above the summit of Agung on 25 November 2017 and drifted W. Courtesy of PVMBG (Letusan Gunung Agung 25 November 2017 Pukul 17:30 Wita). Around 0545 local time the following day (26 November), the intensity of the ash emissions increased; the top of the plume reached 3,300 m above the summit at 1100 local time, and was drifting SE and E (figure 11). Ashfall was reported in many areas downwind including North Duda (9 km S), Duda Timur (12 km S), Pempetan, Besakih, Sideman (15 km SSW), Tirta Abang, Sebudi (6 km SW), Amerta Bhuana (10 km SSW), and some villages in Gianyar (20 km WSW) (figure 12). The largest amount, deposits 5 mm thick, was reported in Sibetan (11 km SSE). Trace amounts of ash were also reported much farther away, in Nusa Penida (an island 40 km S), Lombok (100 km ESE), and Sumbawa, 250 km E on the island of West Nusa Tenggara. Explosions from the crater were audible 12.5 km away that evening. Incandescence at the summit was observed from Bukit Asah and Batulompeh. The Darwin VAAC reported continuous ash emissions to 7.9 km altitude drifting SE throughout most the day, increasing to 9.1 km later in the day; ashfall was also reported at the international airport. Figure 11. A dense plume of ash rose 3,000 m above the summit of Agung and drifted ESE on 26 November 2017. Courtesy of PVMBG (Peningkatan Status Gunungapi Agung, Bali Dari Level III (siaga) Ke Level IV (awas), 27 November 2017). Figure 12. Ash from an eruption of Agung on 26 November 2017 covered garden plants in Jungutan Village, 7 km SE. Courtesy of Reuters. The airport in Denpasar was forced to close during 27-29 November 2017. On those days ash drifted in multiple directions at different altitudes; it was observed drifting E at 9.1 km altitude, SW at 7.6 km altitude, and was moving S below 6.1 km. This increase in emissions led PVMBG to raise the Alert Level from III to IV on 27 November. Pictures and video showed a white steam plume adjacent to a gray ash plume rising from the crater, suggesting two distinct sources (figure 13). Figure 13. 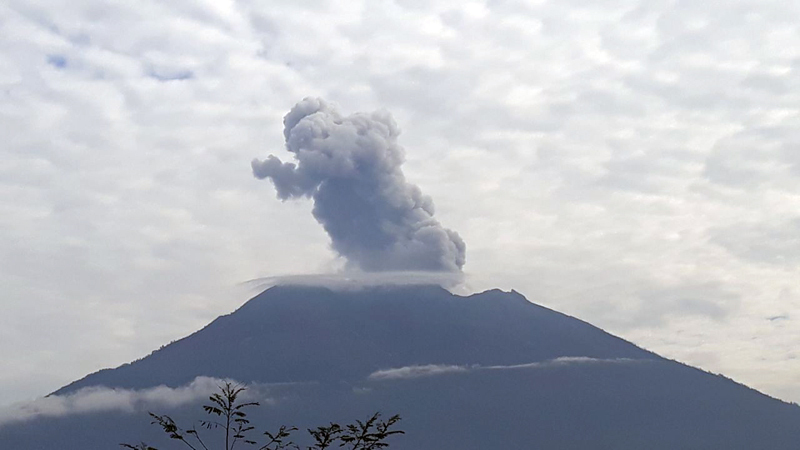 A white steam plume and dense gray ash both rose from the summit of Agung on 27 November 2017. Photo by K. Parwata, courtesy of Sutopo Purwo Nugroho, Twitter. A single MODVOLC thermal alert appeared at the summit that day, along with a strong thermal anomaly in the MIROVA system data (figure 14) consistent with the appearance of new lava in the summit crater. The tiltmeter installed at the Yehkori station 4 km S of the summit showed continued inflation of up to 6 microradians between 22 and 27 November (figure 15). PVMBG also increased the exclusion zone to a radius of 8 km from the summit crater plus areas 10 km from the summit to the NNE, SE, S, and SW. Figure 14. A MIROVA plot of satellite infrared data for the year ending 23 February 2018 showed the first thermal anomaly from Agung in late November 2017, consistent with the emergence of lava in the summit crater. Courtesy of MIROVA. Figure 15. A steady inflation was measured by the tiltmeter located at the Yehkori station 4 km S of the summit of Agung between 22 November and 27 November. Courtesy of PVMBG (Peningkatan Status Gunungapi Agung, Bali Dari Level III (siaga) Ke Level IV (awas), 27 November 2017). MAGMA Indonesia reported that beginning with the ash eruption on 21 November, lahars appeared in the Tukad Yehsa, Tukad Sabuh, and Tukad Beliaung drainages on the S flank, as well as Tukad Bara on the N flank. As of the end of November 2017, these lahars had impacted houses, roads, and agricultural areas. Although ash emissions increased, and lava was confirmed within the summit crater during the last week of November, the number of seismic events remained well below the values recorded during September and October (figure 16). Figure 16. Seismicity at Agung decreased significantly beginning on 20 October 2017 and remained well below 200 daily events throughout November, even though ash emissions began on 21 November. Courtesy of PVMBG (Peningkatan Status Gunungapi Agung, Bali Dari Level III (siaga) Ke Level IV (awas), 27 November 2017). Ash emissions were reported by PVMBG rising to 3,000 m above the summit and drifting S on 27 November (figure 17). Continuing ash emission during 28-29 November rose to 2,000-4,000 m above the summit and drifted WSW (figure 18). Continuous seismic tremors were recorded during 28 November-1 December. Figure 17. Ash plumes from Agung rose to altitudes of around 6,000 m (3,000 m above the summit crater) and drifted S on 27 November 2017. Image courtesy of MAGMA Indonesia (Peningkatan Status Gunungapi Agung, Bali Dari Level Ill (SIAGA) ke Level IV (AWAS), 27 November 2017 10:07 WIB, Ir. Kasbani, M.Sc.). Figure 18. 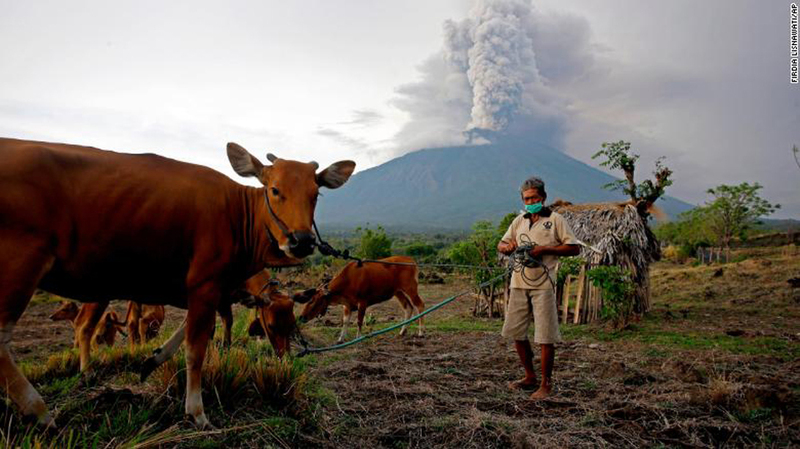 A dense plume of steam and ash rose from Agung and drifted away from this villager and his livestock on 28 November 2017. Courtesy of CNN. With the increase in ash emissions during the last days of November 2017, satellite instruments also recorded significant releases of SO2 (figure 19). MAGMA Indonesia reported on 1 December that satellite data also recorded high temperatures consistent with new lava within the crater on 27, 28, and 29 November 2017. They estimated the volume of lava in the crater to be about 20 million cubic meters, equivalent to about a third of the total crater volume. The base of the ash-and-steam plumes was often reddish during 29 November-5 December reflecting incandescence from the lava in the crater (figure 20). Figure 19. The concentrations of SO2 emitting from Agung increased to levels that were easily detected by the Ozone Mapper Profiler Suite (OMPS) on the Suomi National Polar-orbiting Partnership (Suomi-NPP) satellite on 27 (top) and 28 (bottom) November 2017. The concentration of SO2 is measured in Dobson Units, a measure of the molecular density of the SO2 in the atmosphere. These NASA Earth Observatory images were created by Joshua Stevens, using OMPS data from the Goddard Earth Sciences Data and Information Services Center (GES DISC). Figure 20. Incandescence appeared at the base of the ash-and-steam plume at Agung on 29 November 2017, consistent with lava effusion in the summit crater. Courtesy of MAGMA Indonesia (Perkembangan Terkini Aktivitas Gunung Agung (1 Desember 2017 21:00 WITA), 2 December 2017 07:55 WIB, Ir. Kasbani, M.Sc.). By 29 November, continuous ash emissions were rising to 6.4 km altitude and drifting from the SW towards the S, becoming diffuse over the Denpasar region (figure 21). The plume was observed moving E at the same elevation on 30 November, lowering to 5.5 km later in the day. Although emissions were primarily steam and gas beginning on 30 November, pilot reports on 1 December indicated ash was still visible SE of Agung, and steam-and-ash emissions were continuing. Steam-only emissions were reported on 2 December rising less than 1,000 m above the summit. Figure 21. 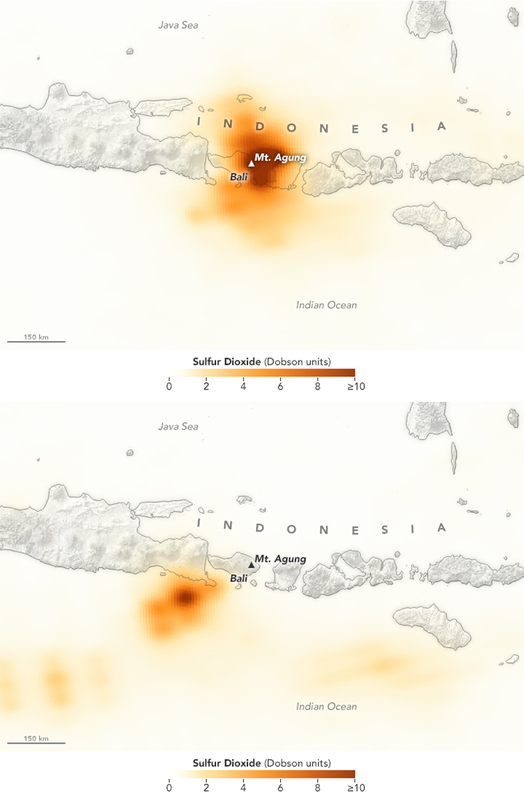 Gas-and-ash emissions from Agung on 29 November 2017 were drifting both W and S in this false-color image generated by the Moderate Resolution Imaging Spectroradiometer (MODIS) on NASA's Terra satellite. The image uses a combination of shortwave infrared light and natural color, making it easier to differentiate between ash, clouds, and forest. The plumes appear to rise from two vents in the volcano's summit crater. Courtesy of NASA Earth Observatory. Activity during December 2017. Steam, gas, and ash emissions continued throughout December 2017. During the first two weeks, emissions were primarily steam and gas, rising up to 2,000 m (figure 22), and incandescence was often observed at the summit. Dense gray ash emissions were observed, however, during 1-2 December. BNPB noted on 5 December that 63,885 evacuees were distributed in 225 evacuation shelters. On 8 December at 0759 a brief event generated a dense ash plume that rose 2.1 km above the crater rim and drifted W (figure 23). Minor amounts of ash were deposited on the flanks, and lapilli were reported in Temakung. A second ash plume rose 3 km at 1457 later that day. Figure 22. A burst of dense steam rose as high as 1,500 m from the crater of Agung on 5 December 2017 at 0848 local time (WITA) and drifted E, after which only a narrow diffuse plume remained. View is from the S. Courtesy of Sutopo Purwo Nugroho, Twitter. Figure 23. 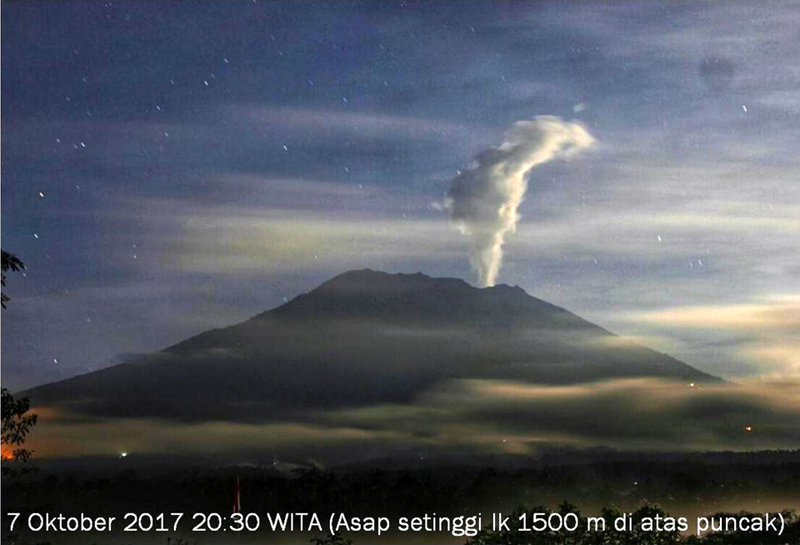 An eruption at Agung on 8 December 2017 at 0759 WITA sent a dense gray ash plume 2,100 m above peak to the W. View is from the S. Courtesy of Sutopo Purwo Nugroho, Twitter. The Darwin VAAC reported multiple daily explosions during 8-15 December, creating ash plumes that drifted NW, W, and WSW at altitudes between 4.3 and 5.5 km. The explosions were visible in the webcams and from ground-based observers, and occasionally in satellite imagery when not blocked by weather clouds. VONA's were issued for events on 8 and 12 December. Multiple events during 11-12 December sent plumes rising up to 2.5 km above the crater rim and drifting NW and W (figure 24). Figure 24. A small ash emission rose from the crater of Agung during the early morning of 11 December 2017. Courtesy of Sutopo Purwo Nugroho, Twitter. The Darwin VAAC reported larger ash emissions to 7.6 km altitude on 15 and 16 December interspersed with lower altitude (5.5-6.1 km) plumes. Continuing, regular discrete emissions during 16-17 December rose to 6.1 km and drifted WNW. 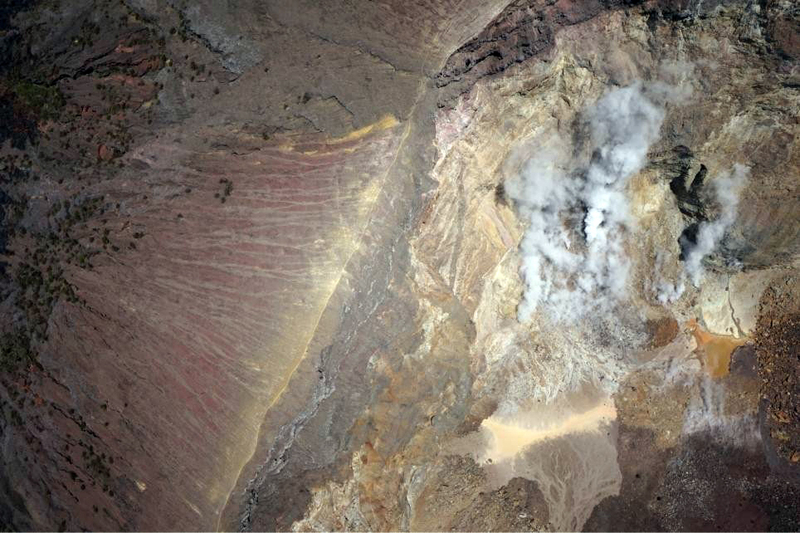 An overhead image of the summit crater of 16 December revealed that, since a similar photo was taken on 20 October, new lava had filled about 1/3 of the crater with an estimated 30 million cubic meters of material (figure 25). Figure 25. Repeated overhead images of the Agung summit crater taken on 20 October and 16 December 2017 showed new lava filling about 1/3 of the crater with an estimated 30 million cubic meters of material. Posted on Twitter by Sutopo Purwo Nugroho for BNBP. Discrete emissions to 5.5 km moving N and NNE were common during 18-21 December. Ash and steam drifted both E and W from the summit on 22 December. An ash emission on 23 December rose to 5.8 km and drifted NE, after which repeated emissions continued, rising to 4.6 km (figure 26). Ash fell on the flanks and in Tulamben, Kubu (9 km NE). In the morning of 24 December, a much larger plume drifting W at 10.7 km altitude was visible in satellite imagery. It dissipated after a few hours, and a separate plume was observed drifting NE at 5.5-5.8 km (figure 27); emissions continued throughout the day and into the next. PVMBG reported that the ash deposits from the NE-drifting plume were up to 3 mm thick (figure 28). Figure 26. An event at Agung on 23 December 2017 sent a dense, gray plume to 2,500 m above the crater rim at 1157 WITA. View is from a village on the W flank, likely about 7 km from the summit. Courtesy of Sutopo Purwo Nugroho, Twitter. Figure 27. Agung erupted steam and ash with a plume height of 2,000-2,500 m on 24 December 2017 at 1005 WITA. Courtesy of Sutopo Purwo Nugroho, Twitter. Figure 28. Map showing distribution and thickness of volcanic ash and lapilli from the ash emissions at Agung that began on 24 December 2017 at 1005 WITA. A thin layer of ash was deposited in a narrow NE trending band on the NE side of Agung. Courtesy of Sutopo Purwo Nugroho, Twitter. As of 25 December, BNPB reported just over 70,000 evacuees spread out in 239 shelters. Discrete ash emissions continued through the end of the month rising as high as 2 km above the crater rim and drifting in several different directions. The last VAAC report of 2017 indicated an ash plume drifting W at 4.3 km altitude on 31 December. References: Chaussard E, Amelung F, Aoki Y, 2013, Characterization of open and closed volcanic systems in Indonesia and Mexico using InSAR time series. J Geophys Res Solid Earth, 118:3957–3969. DOI: 10.1002/jgrb.50288. Fontijn K, Costa F, Sutawidjaja I, Newhall C G, Herrin J S, 2015, A 5000-year record of multiple highly explosive mafic eruptions from Gunung Agung (Bali, Indonesia): implications for eruption frequency and volcanic hazards. Bull Volcanol, 77: 59. DOI: 10.1007/s00445-015-0943-x. Self S, Rampino M, 2012, The 1963–1964 eruption of Agung volcano (Bali, Indonesia). Bull Volcanol 74:1521–1536. DOI: 10.1007/s00445-012-0615-z. Information Contacts: Pusat Vulkanologi dan Mitigasi Bencana Geologi (PVMBG, also known as Indonesian Center for Volcanology and Geological Hazard Mitigation, CVGHM), Jalan Diponegoro 57, Bandung 40122, Indonesia (URL: http://www.vsi.esdm.go.id/); Badan Nasional Penanggulangan Bencana (BNPB), National Disaster Management Agency, Graha BNPB - Jl. Scout Kav.38, East Jakarta 13120, Indonesia (URL: http://www.bnpb.go.id/); MAGMA Indonesia, Kementerian Energi dan Sumber Daya Mineral (URL: https://magma.vsi.esdm.go.id/); NASA Earth Observatory, EOS Project Science Office, NASA Goddard Space Flight Center, Goddard, Maryland, USA (URL: http://earthobservatory.nasa.gov/); NASA Goddard Space Flight Center (NASA/GSFC), Global Sulfur Dioxide Monitoring Page, Atmospheric Chemistry and Dynamics Laboratory, 8800 Greenbelt Road, Goddard, Maryland, USA (URL: https://so2.gsfc.nasa.gov/); MIROVA (Middle InfraRed Observation of Volcanic Activity), a collaborative project between the Universities of Turin and Florence (Italy) supported by the Centre for Volcanic Risk of the Italian Civil Protection Department (URL: http://www.mirovaweb.it/); Hawai'i Institute of Geophysics and Planetology (HIGP) - MODVOLC Thermal Alerts System, School of Ocean and Earth Science and Technology (SOEST), Univ. of Hawai'i, 2525 Correa Road, Honolulu, HI 96822, USA (URL: http://modis.higp.hawaii.edu/); Antara News (URL: https://bali.antaranews.com); Sutopo Purwo Nugroho, Head of Information Data and Public Relations Center of BNPB via Twitter (URL: https://twitter.com/Sutopo_PN); Cable News Network (CNN), Turner Broadcasting System, Inc. (URL: http://www.cnn.com/); Reuters (URL: http://www.reuters.com/). Symmetrical Agung stratovolcano, Bali's highest and most sacred mountain, towers over the eastern end of the island. The volcano, whose name means "Paramount," rises above the SE caldera rim of neighboring Batur volcano, and the northern and southern flanks extend to the coast. 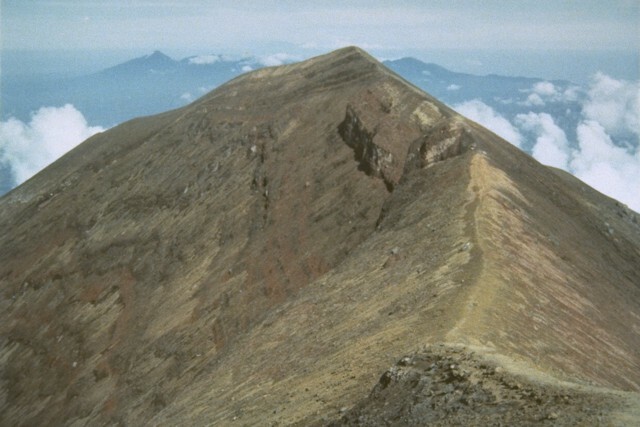 The summit area extends 1.5 km E-W, with the high point on the W and a steep-walled 800-m-wide crater on the E. The Pawon cone is located low on the SE flank. Only a few eruptions dating back to the early 19th century have been recorded in historical time. The 1963-64 eruption, one of the largest in the 20th century, produced voluminous ashfall along with devastating pyroclastic flows and lahars that caused extensive damage and many fatalities. Remarks: Shallow-sourced inflation at Agung has so far not resulted in eruption. Averaged 2006?2009 LOS velocity map of the west Sunda volcanic arc, Indonesia, from ALOS InSAR time series, overlaying SRTM V4 DEM. Only pixels with a temporal coherence larger than 0.6 are shown. Black arrows: relative plate convergence rates at the Sunda trench (red line). Insets: zoom into 7 deforming volcanic centers, upper left: inflating volcanoes, lower right: deflating volcano. From: Chaussard and Amelung 2012. Reference List: Chaussard and Amelung 2012. There is no Emissions History data available for Agung. An eruption column towers above Bali's Agung volcano on March 12, 1963. Five days later a devastating eruption produced pyroclastic flows and lahars that killed 1148 people. Another powerful eruption on May 16 caused additional fatalities. The eruption left tens of thousands homeless. 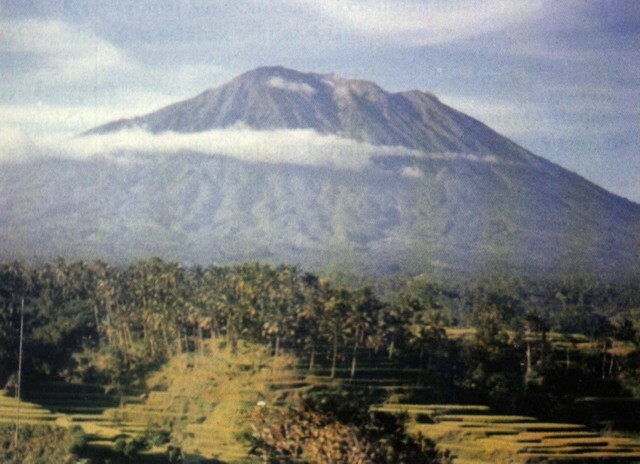 Photo by K. Kusumadinata, 1963 (Volcanological Survey of Indonesia). An ash cloud rises above the summit crater of Agung volcano on March 17, 1963, during the first of two powerful explosive eruptions that caused much devastation to the island of Bali. The eruption began on February 19 as andesitic lava flowed down the northern flank. Major explosive eruptions on March 17 and May 16 produced devastating pyroclastic flows and lahars that killed more than 1100 people. Photo by Djazuli, 1963 (Volcanological Survey of Indonesia). The summit of Bali's Gunung Agung volcano contains a steep-walled, 500-m-wide, 200-m-deep crater that is the source of Agung's historical eruptions. Grayish layers of lava flows and brownish tephra layers from explosive eruptions are exposed in the crater wall. The summit of Agung volcano marks the highest point on the island of Bali. The broad irregular volcanic massif in the far distance is the 11 x 6 km wide Bratan caldera in north-central Bali. Batukau, the largest of several post-caldera cones overtopping the southern rim, is the sharp peak at the left. Three lakes occupy the floor of Bratan caldera. Many of the cones are quite old, but some postdate the youngest dacitic pumice eruptions of Batur volcano (<23,000 years ago). Agung volcano towers over the eastern end of the island of Bali. A steep-walled, 200-m-deep crater is located at the summit of the 3142-m-high volcano, seen here from the Sakta River on the eastern flank. 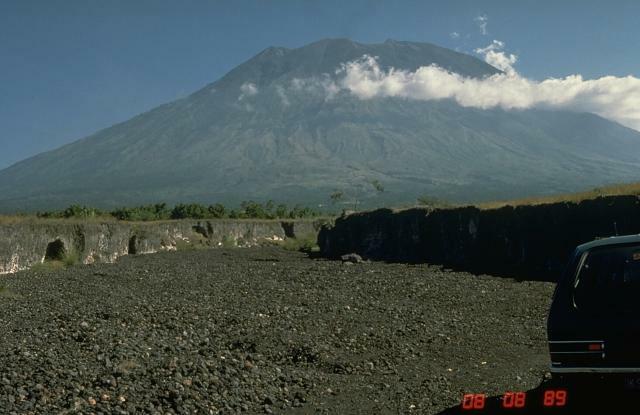 Only three eruptions have been recorded in historical time from Gunung Agung; the latest, during 1963-64, produced devastating pyroclastic flows and lahars. Photo by Tom Pierson, 1989 (U.S. Geological Survey). Gunung Agung, Bali's sacred mountain, towers above rice fields near the Gunungapi Rendang volcano observation post of the Volcanological Survey of Indonesia. The 3142-m-high stratovolcano has erupted infrequently during historical time, but its 1963 eruption was one of the most devastating in Indonesia during the 20th century. Photo by M.E. 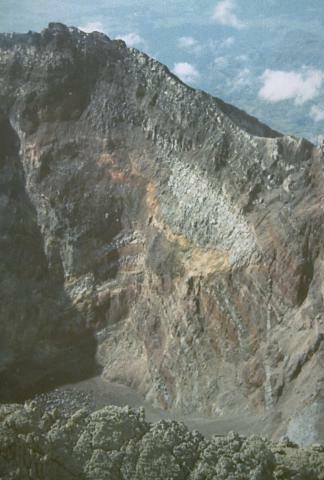 Ilyas, 1991 (Volcanological Survey of Indonesia). The following 7 samples associated with this volcano can be found in the Smithsonian's NMNH Department of Mineral Sciences collections, and may be availble for research (contact the Rock and Ore Collections Manager). Catalog number links will open a window with more information. Large Eruptions of Agung Information about large Quaternary eruptions (VEI >= 4) is cataloged in the Large Magnitude Explosive Volcanic Eruptions (LaMEVE) database of the Volcano Global Risk Identification and Analysis Project (VOGRIPA).